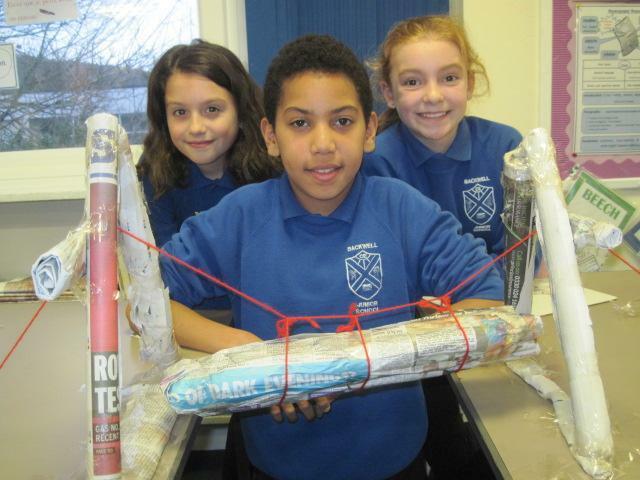 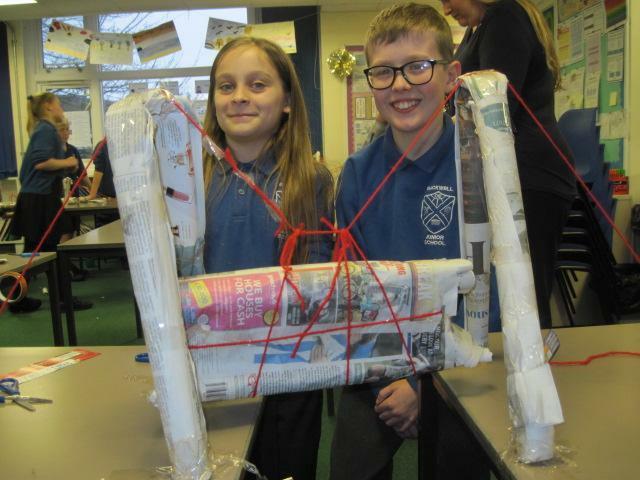 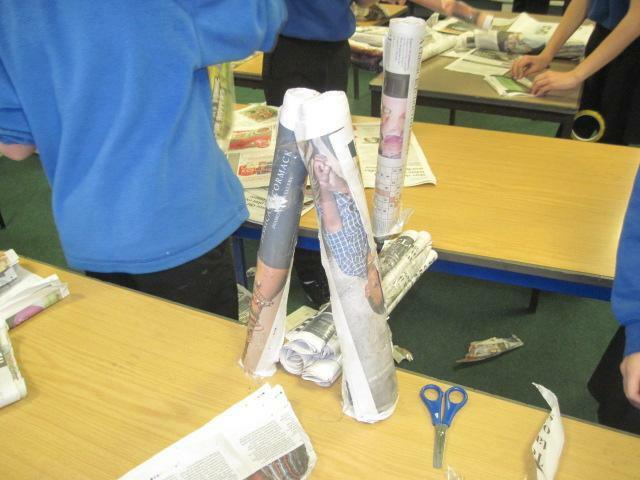 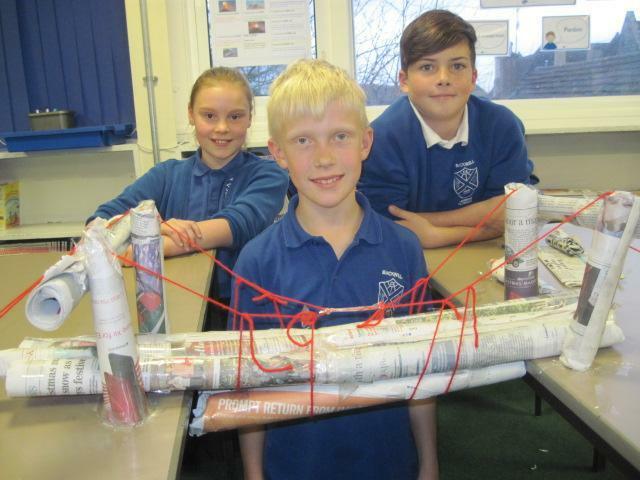 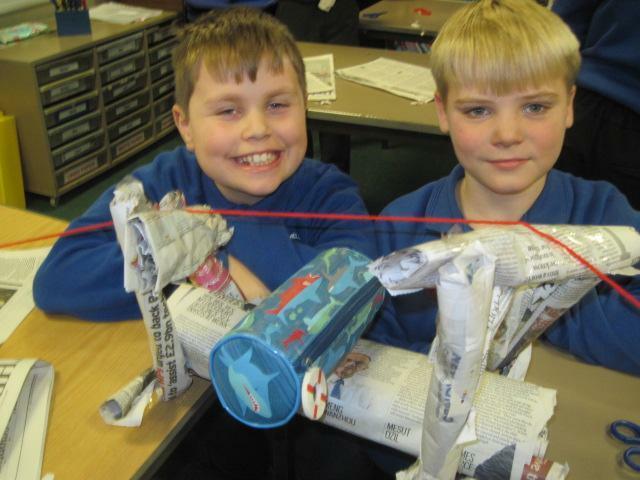 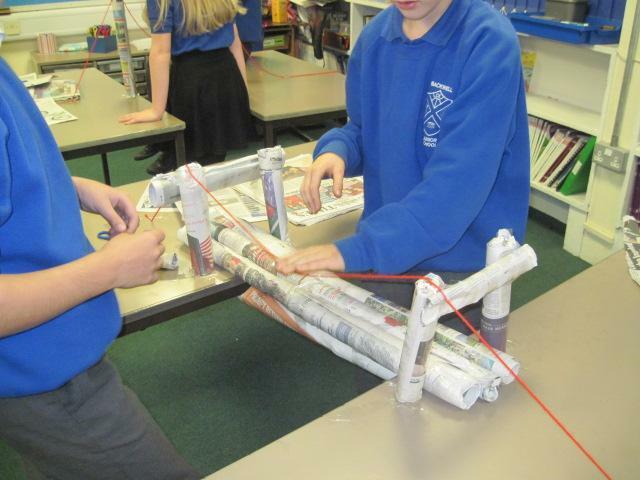 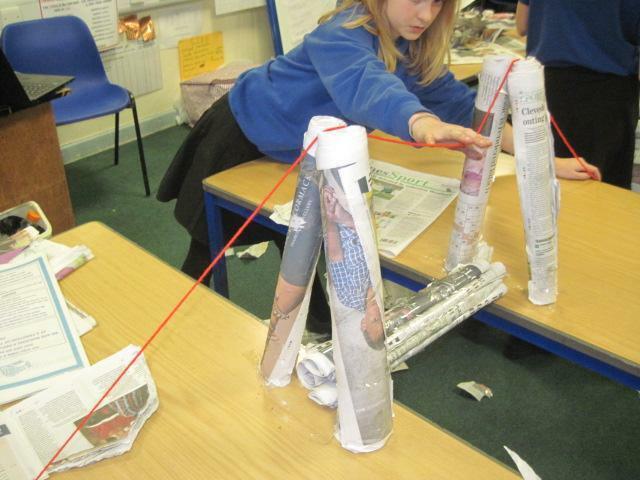 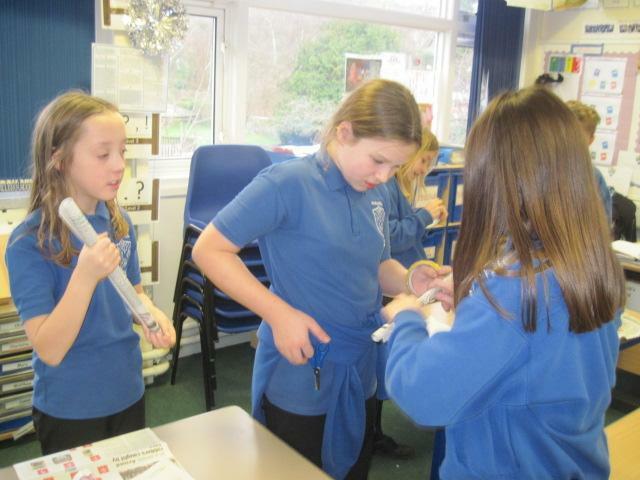 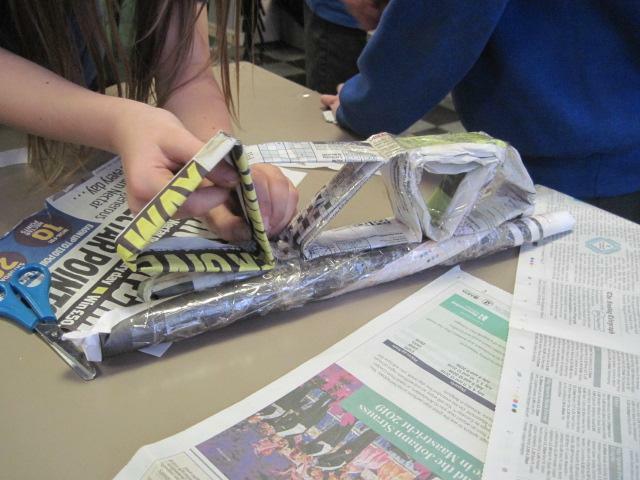 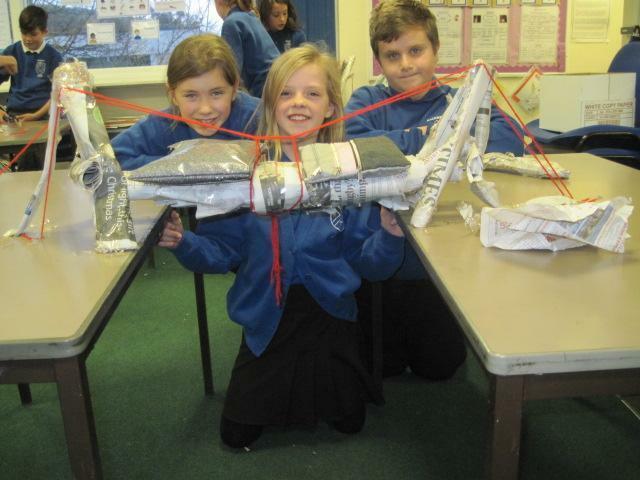 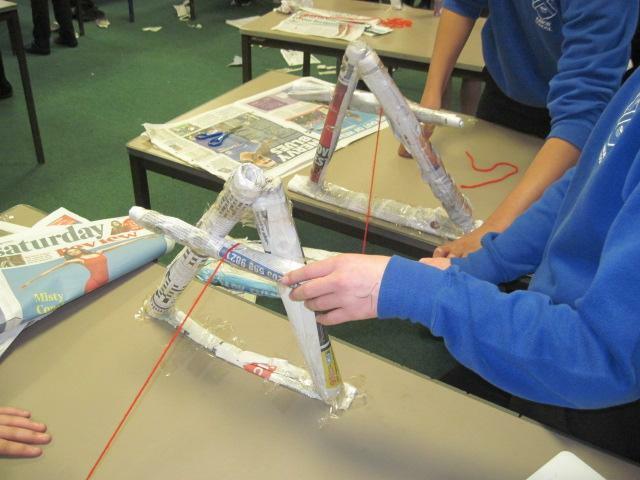 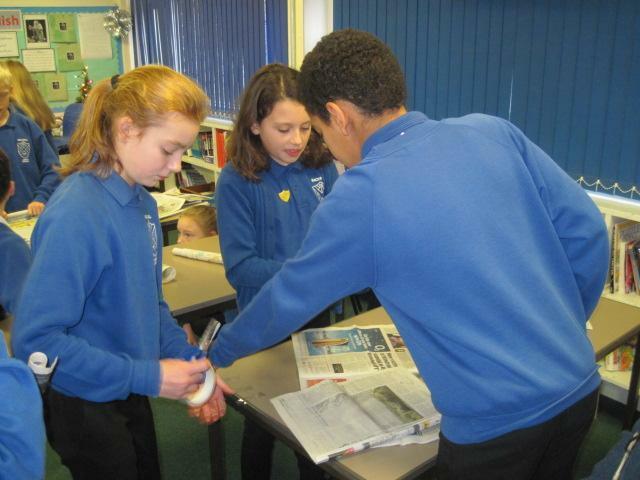 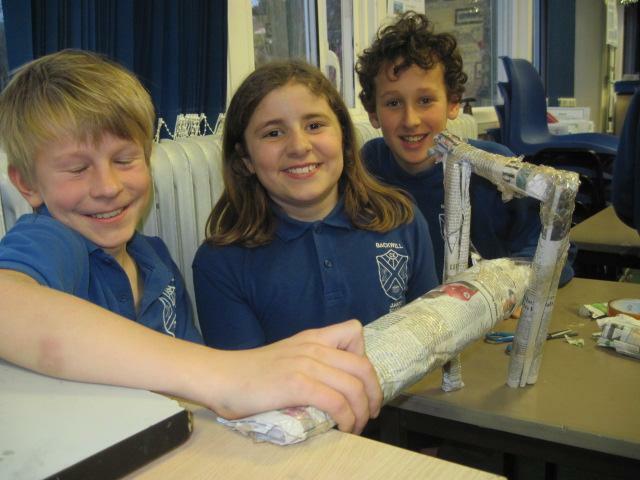 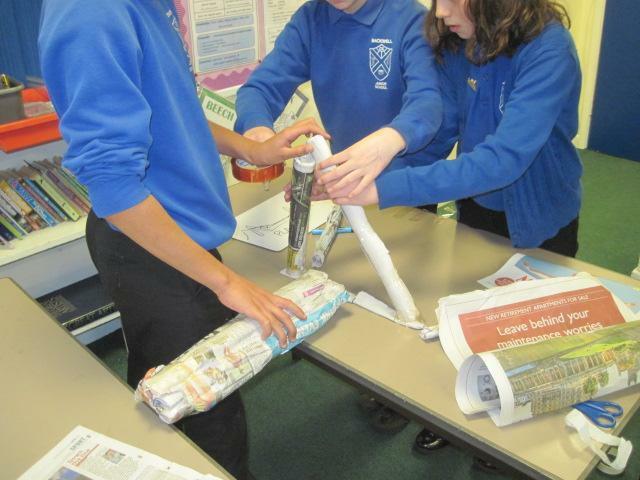 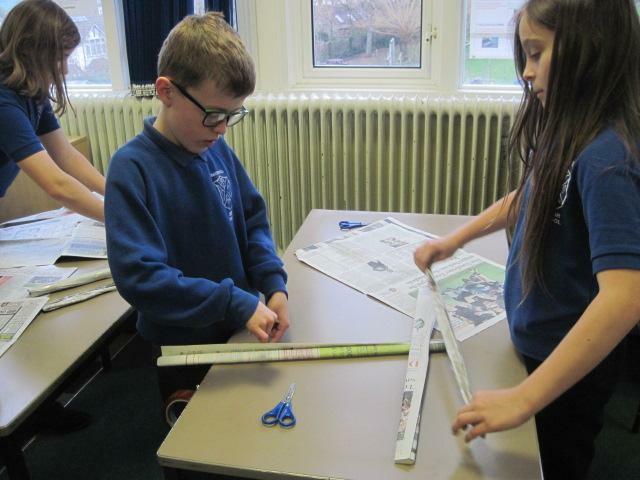 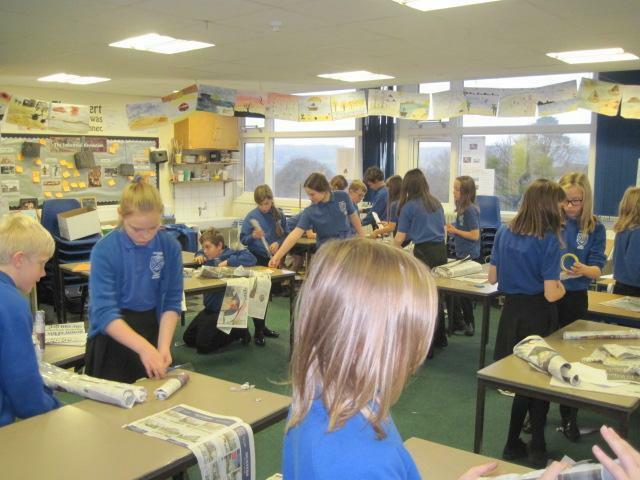 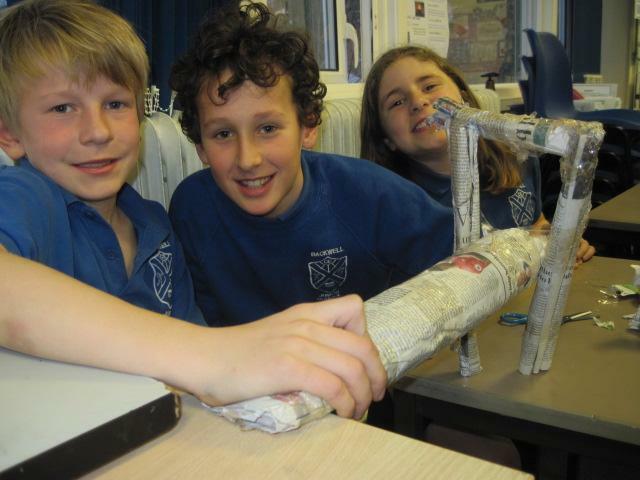 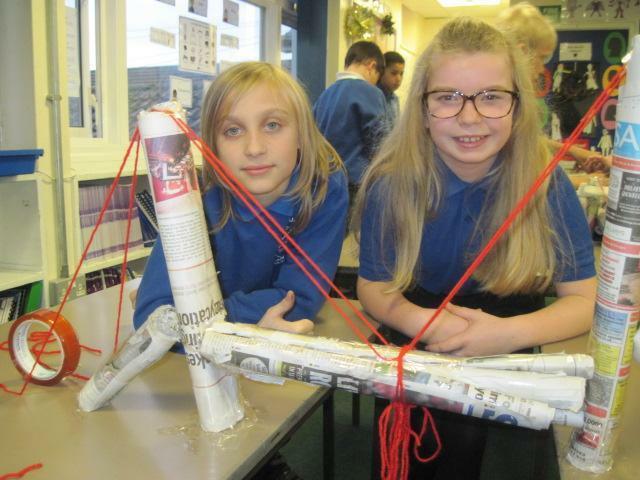 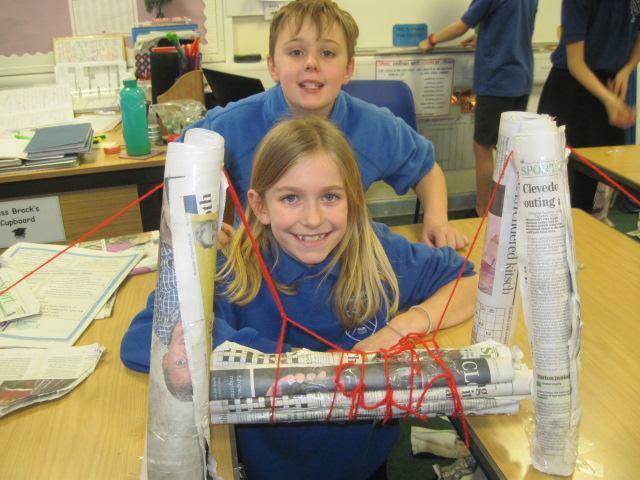 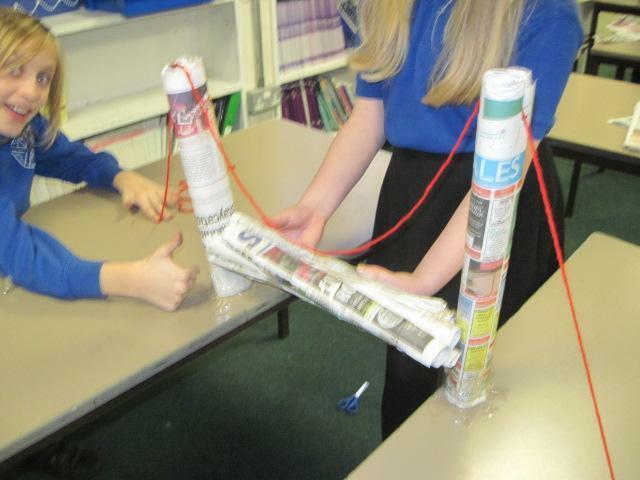 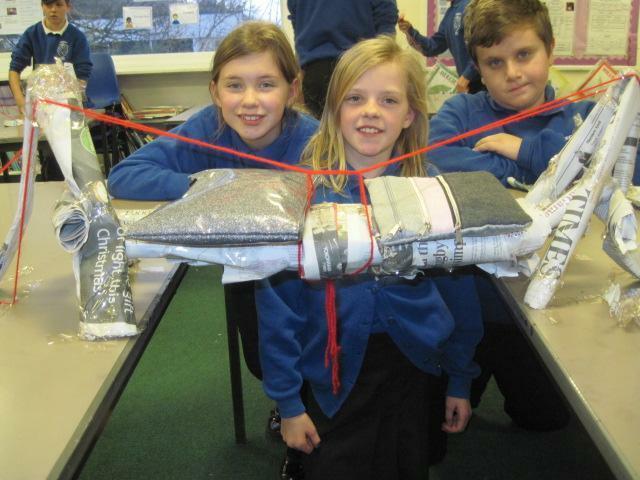 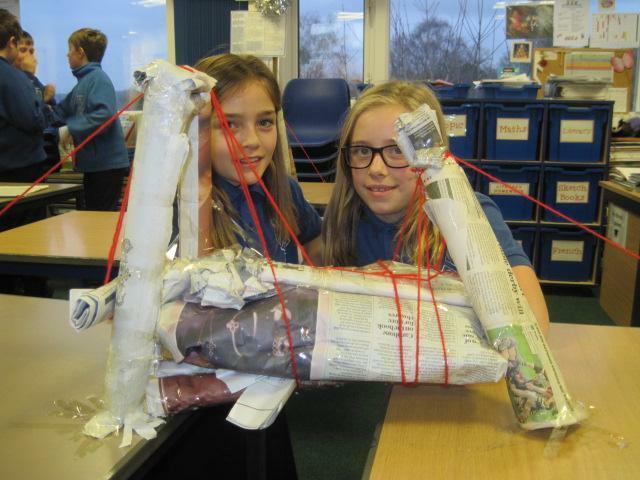 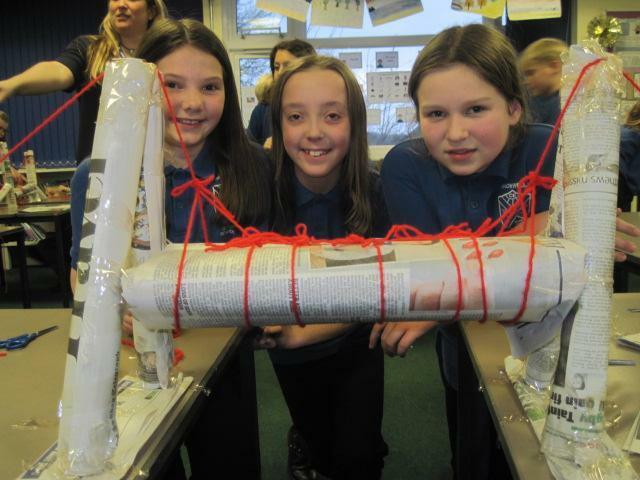 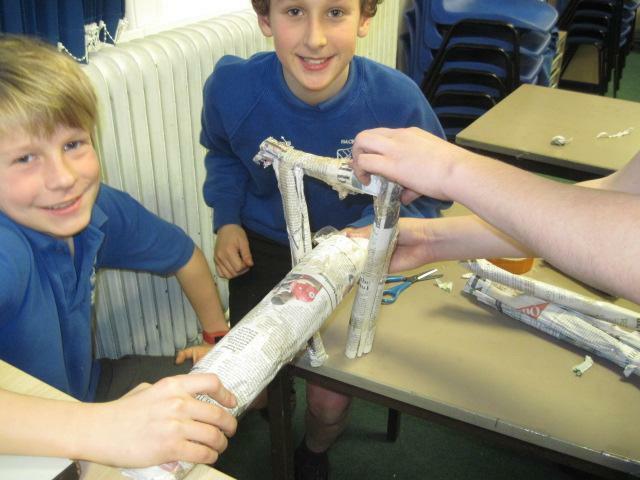 Yesterday, 6B had great fun building suspension bridges using only newspaper, cellotape and wool. 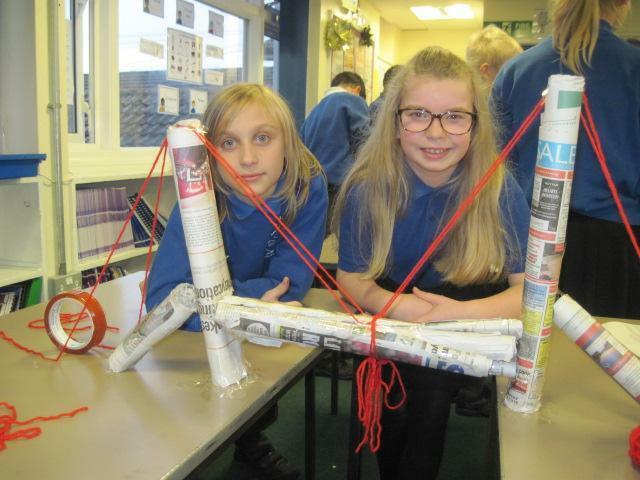 There were lots of wacky ideas but also some great discussions about the use of strong triangular shapes to support their bridges, the difficulties of stretchy suspension cables (wool) and the need to increase the height of the pillars in order for the 'bridge' to actually be suspended. 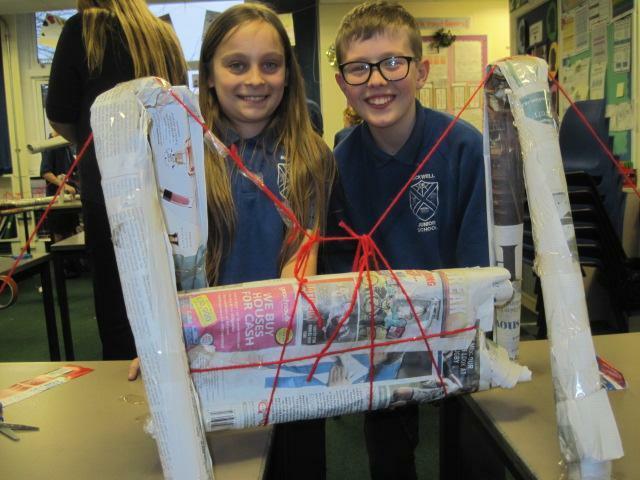 Pippa and Ben were the first successful group with many following quickly behind. 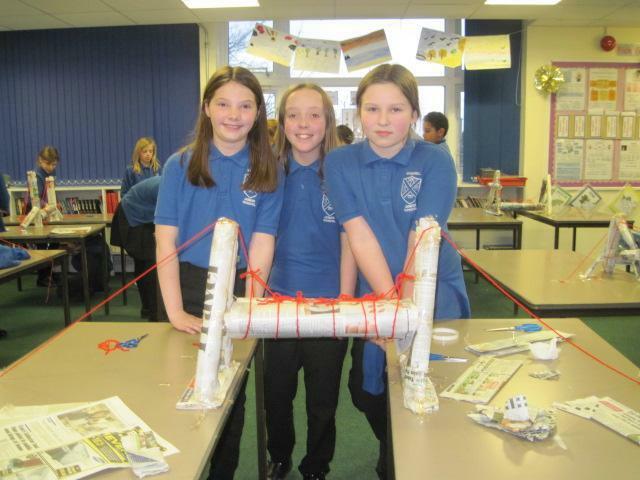 The bridges looked very impressive. 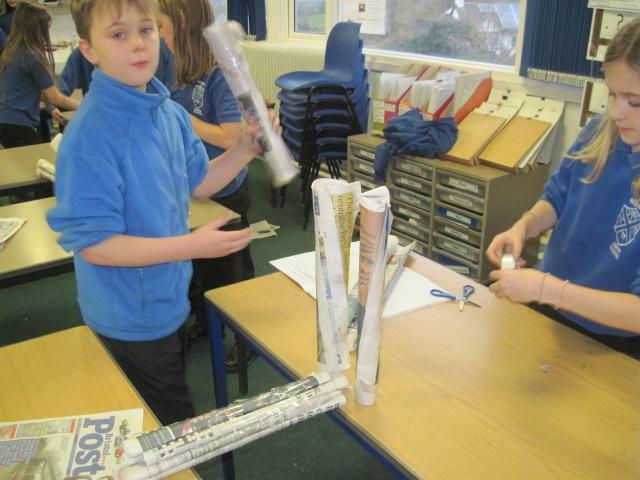 Sadly, we needed the classroom back for the next morning so more fun was had destroying the bridges and recycling the materials. 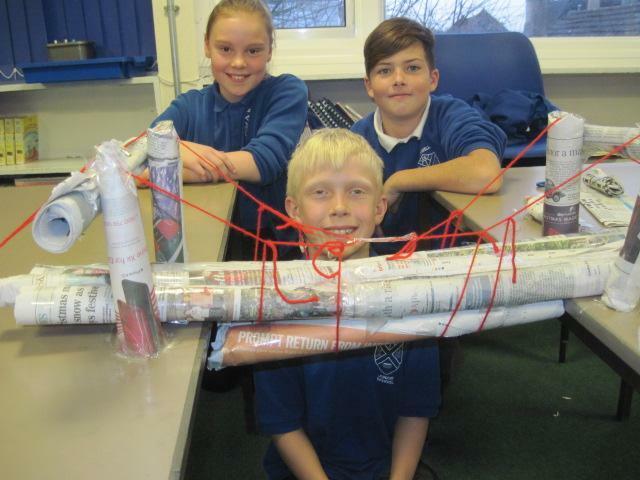 Well done 6B! 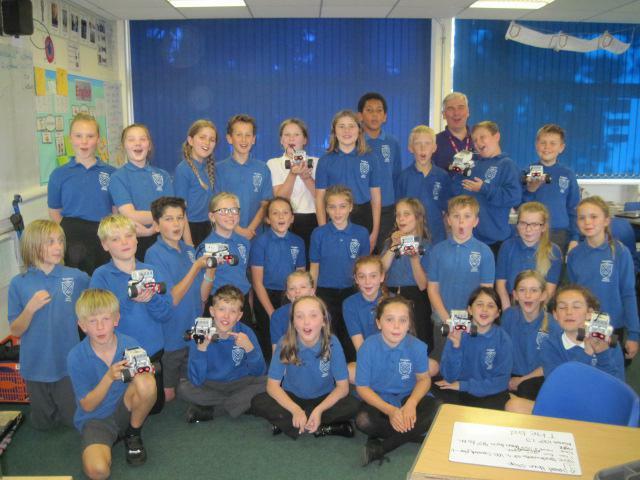 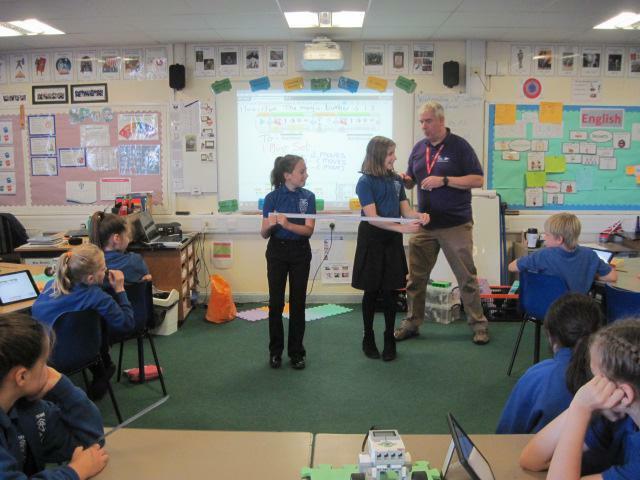 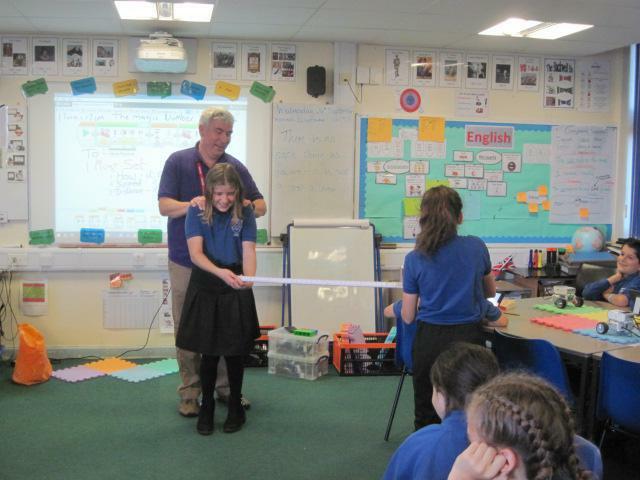 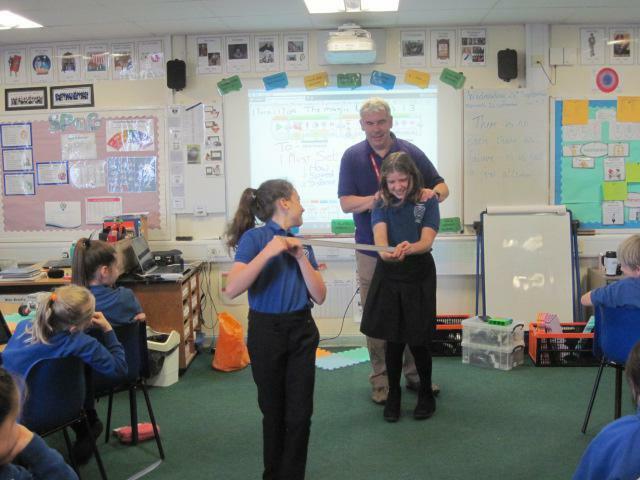 This week, 6B have had a very exciting and interesting visit from Rob who is an engineer in the RAF. 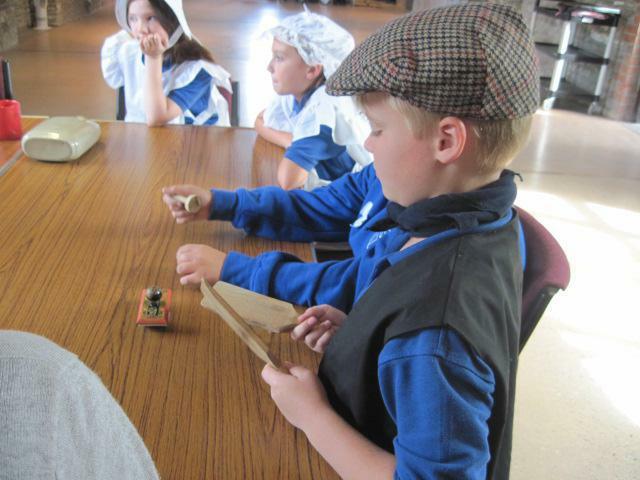 However, Rob did not come to share his expert knowledge of planes. 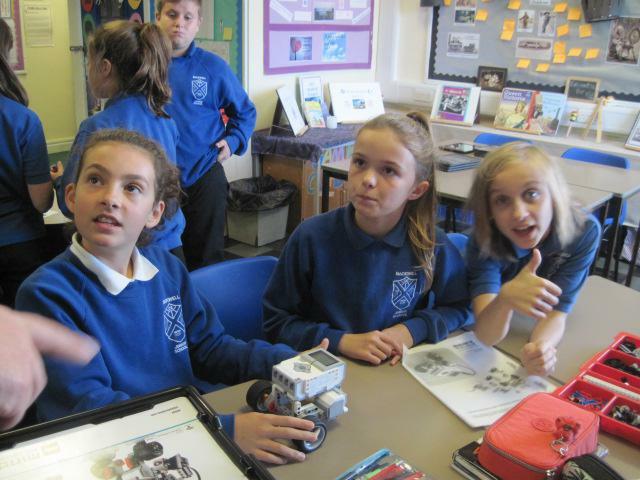 Instead, he helped us enter the fascinating world of programming robots! 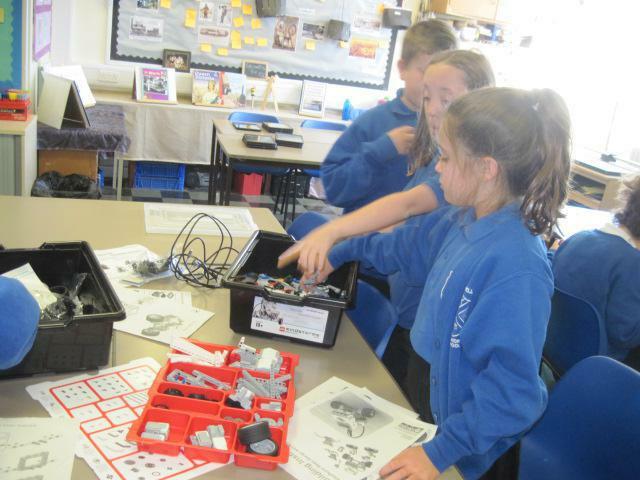 The first thing we needed to do was actually build the robots! 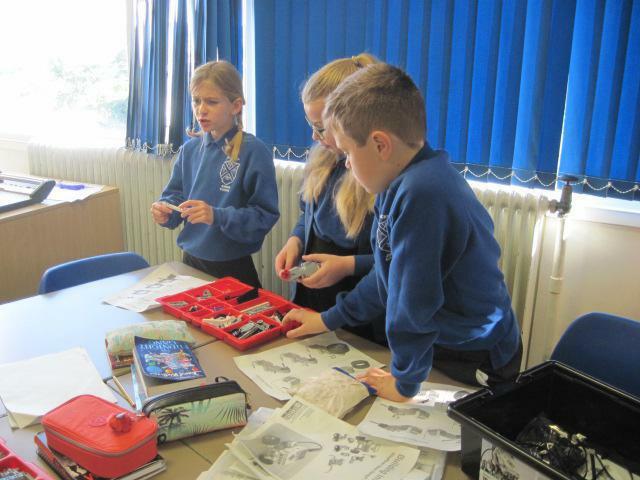 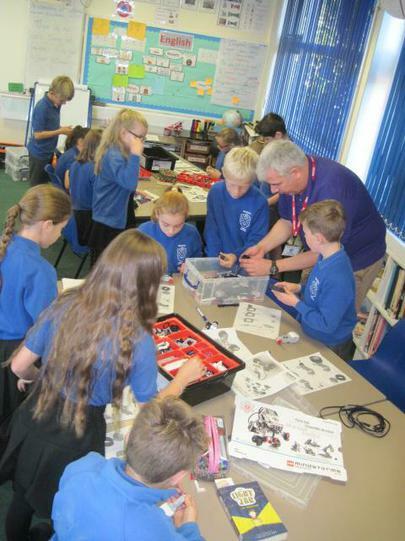 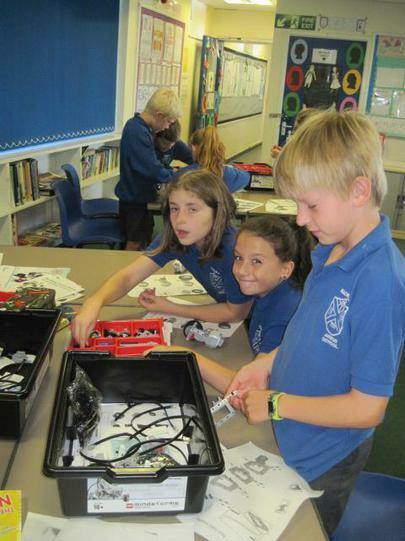 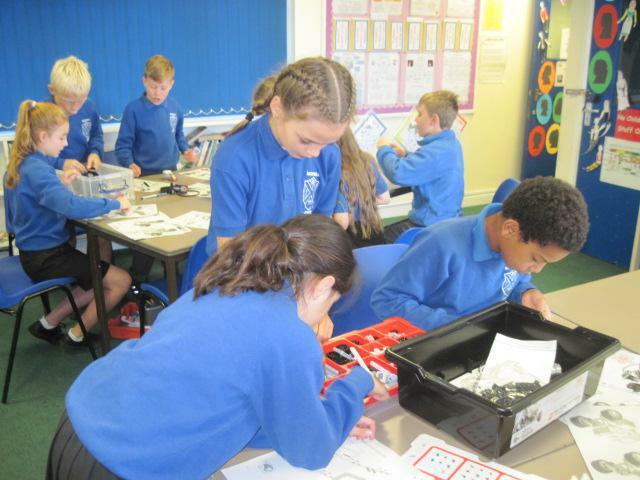 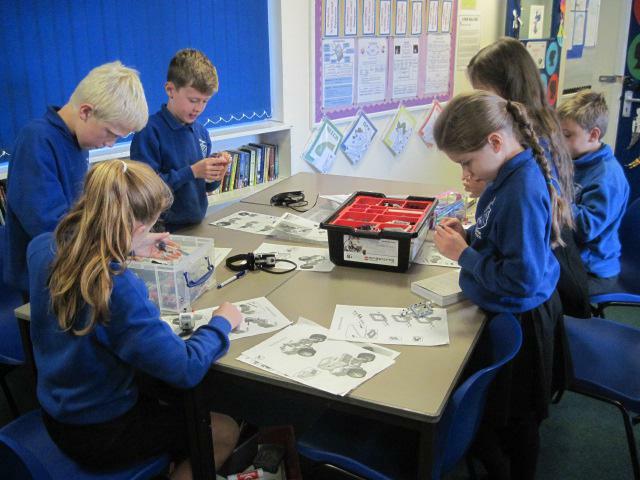 For this, we used special Lego packs, motors and a drive pack. 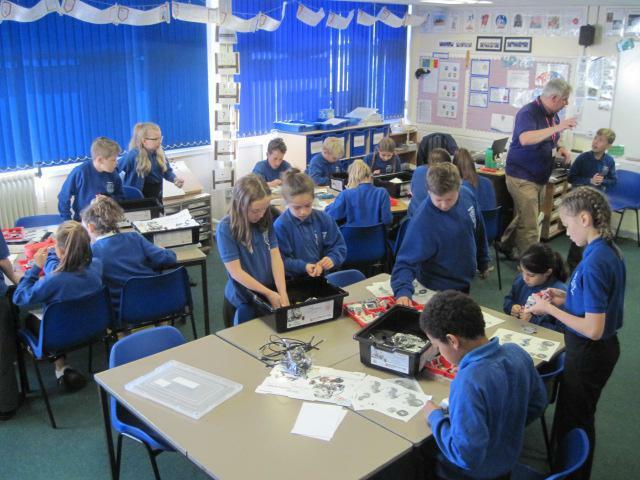 The build didn’t take too long so we were able to start programming them straight after break. 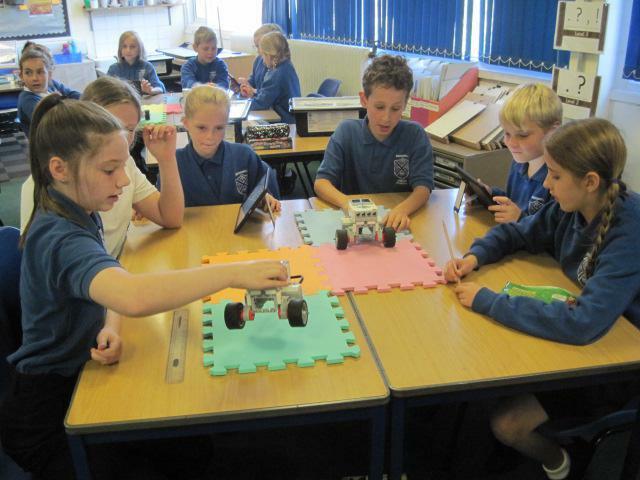 But before we could touch the iPads, we needed to understand how to make the robots turn. 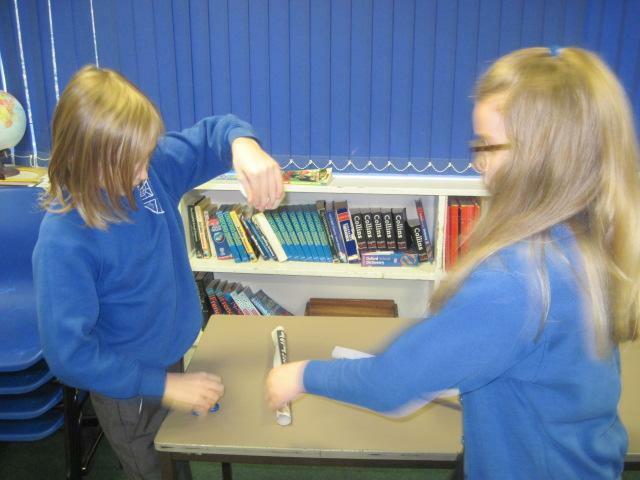 Molly and Eliza made a great pair of motors and clearly demonstrated the moves we needed to code into our robots to make them move in either a swivel, pivot or arc turn. 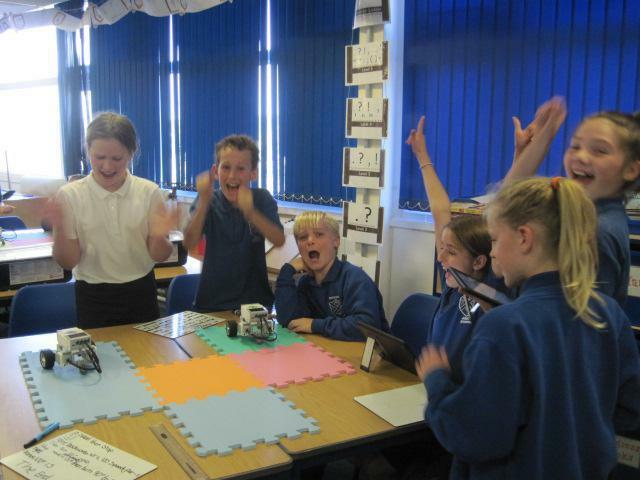 At first, we used simple coding to make the robot go forwards, pause, turn around and come back. 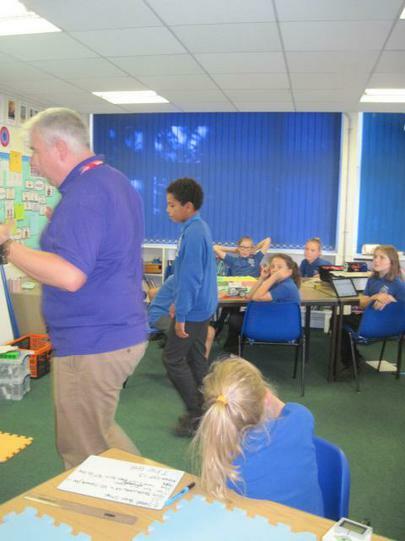 Then we moved onto more difficult tasks focussed on helping us really understand the language needed to code properly. 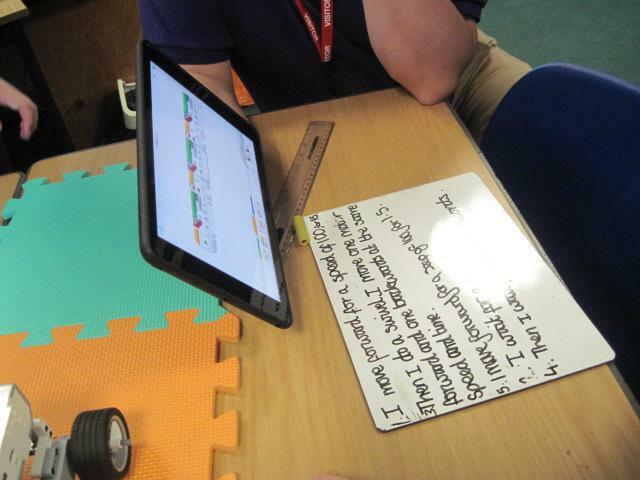 We discovered that the pauses were very important to help us work out where our coding needed to be debugged when it went wrong (we even decided the pauses acted like full stops to help us remember how important they were)! 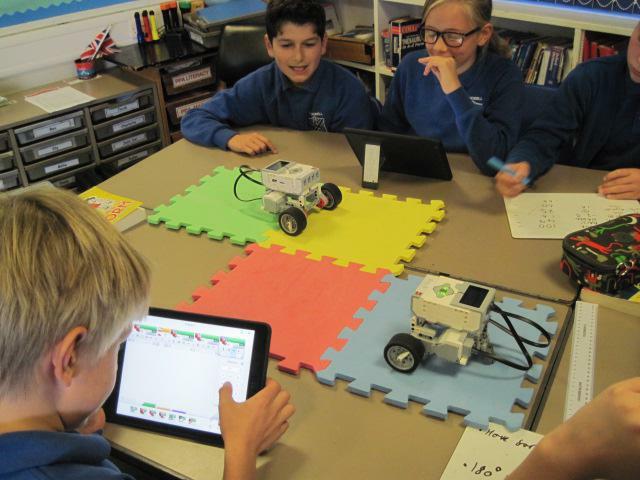 More complex challenges were set including navigating a Y shaped course that had two robots running on it at the same time. 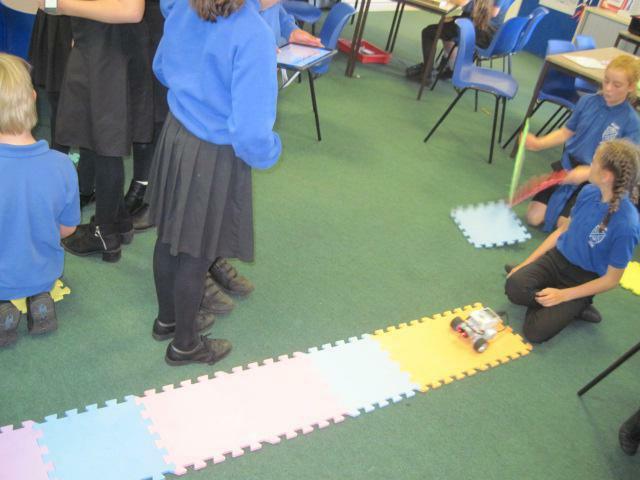 Precision coding was needed to avoid crashes and sliding off the mats! 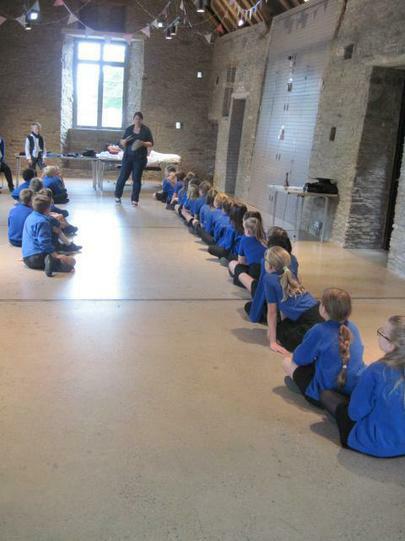 The cheers of success were fantastic to hear as each group completed the course. 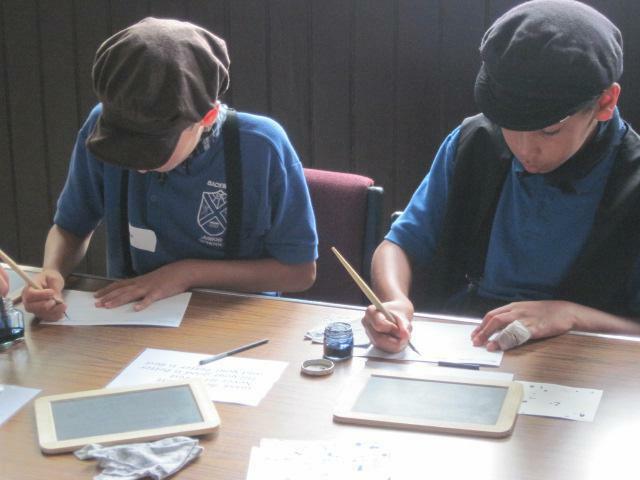 But the coding didn’t stop there! 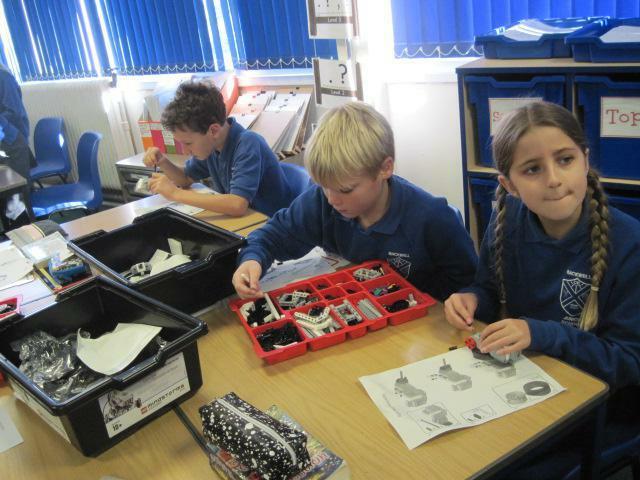 The next level was to fit ultrasonic sensors to our robots that could sense the proximity of an object and perform a pre-programmed command (like stop). 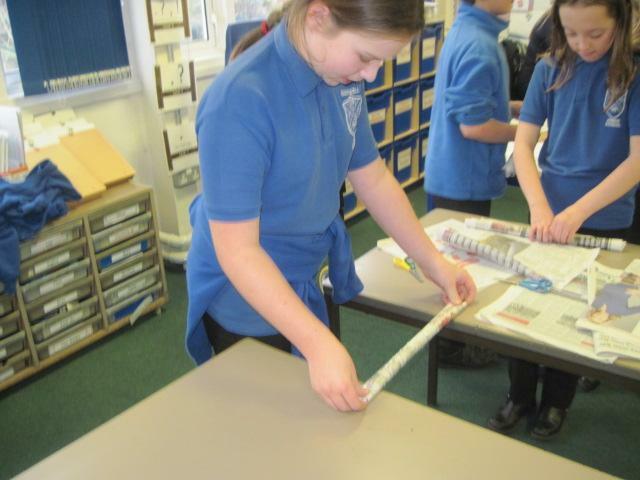 The class quickly got to grips with the extra build required to fit the sensor and the complex language of ‘whilst’ and ‘until’. 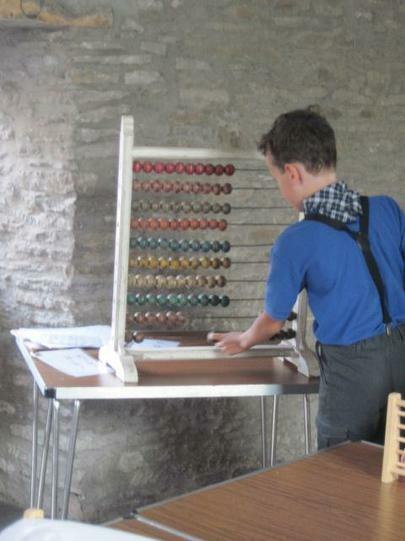 Soon there were robots whizzing along the desks and coming to a complete stop before hitting the pencil pots just as planned. 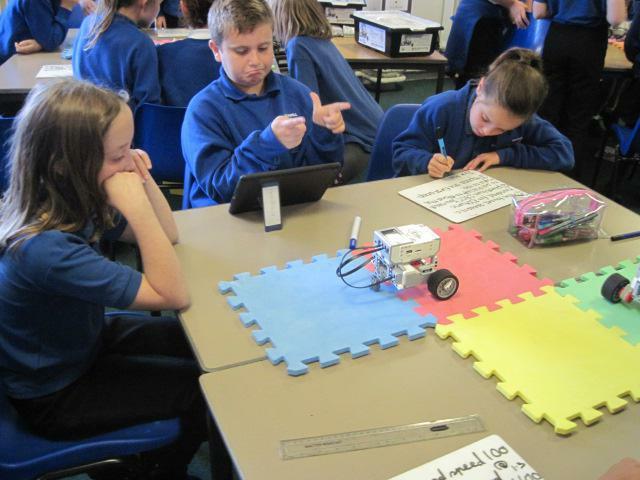 We also had a look at ‘if’ and ‘then’ coding but sadly were only able to see a demo as we had run out of time for the day. 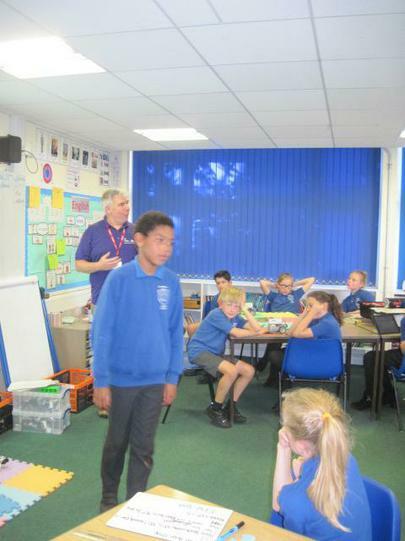 Other demonstrators on the day included Aletor (who showed the importance of the stop command) and Jack Ju (who explained the ‘if’ and ‘then’ coding by sitting down and standing up on cue). 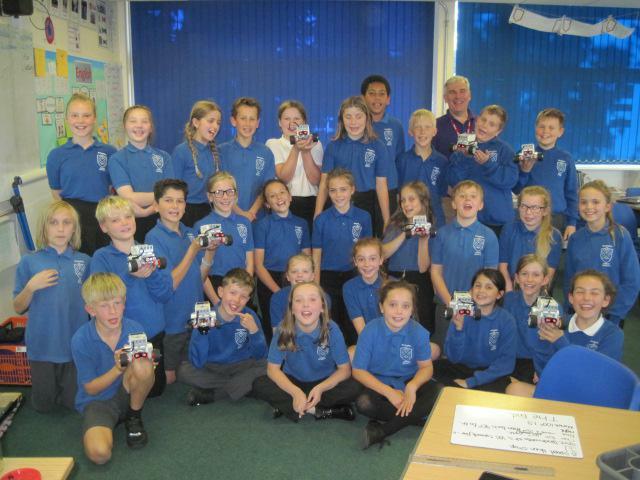 We had a great day and learnt lots about the language of coding, how precise you need to be and how to get robots to do what we actually wanted. 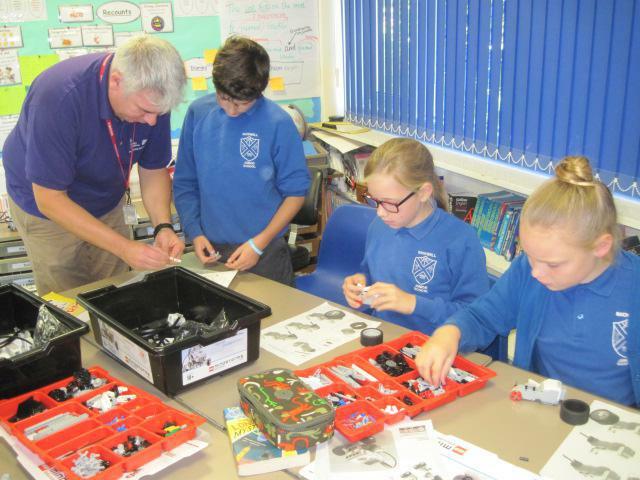 We want to say a huge thank you to Rob who made the day possible!!!! 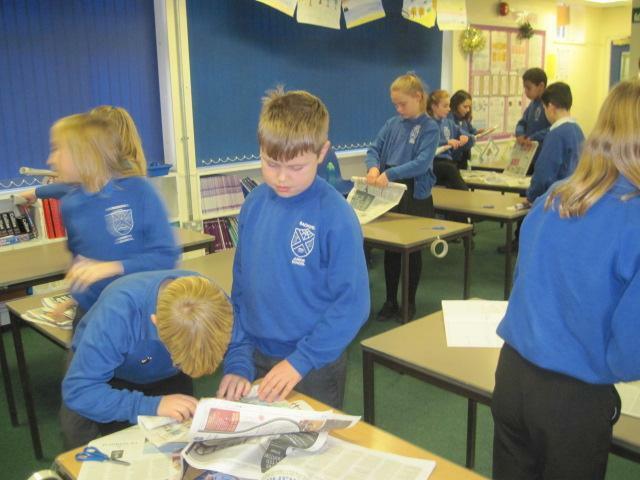 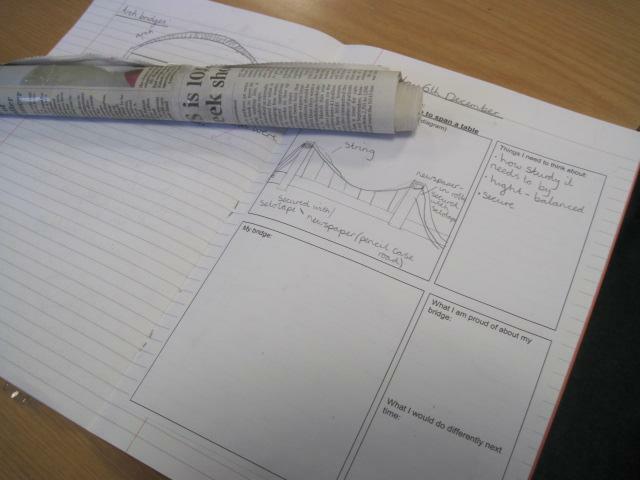 Our first topic in year 6 is the The Industrial Revolution and The Victorians. 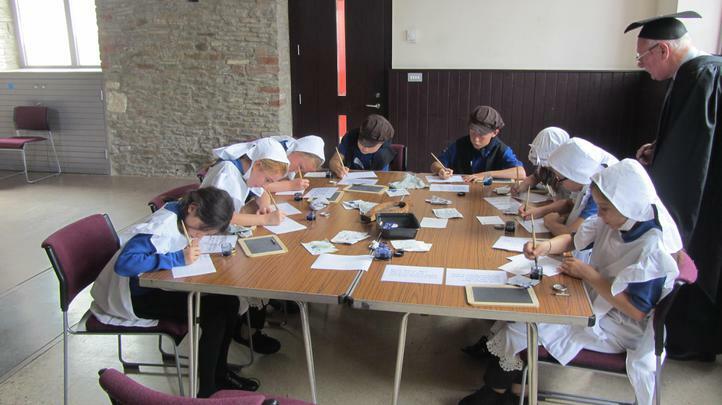 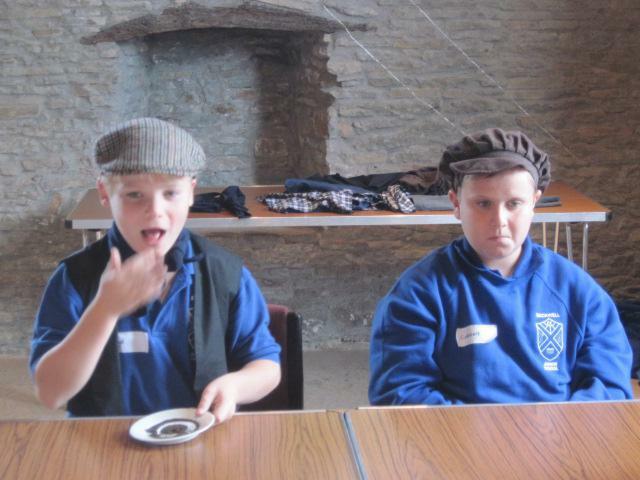 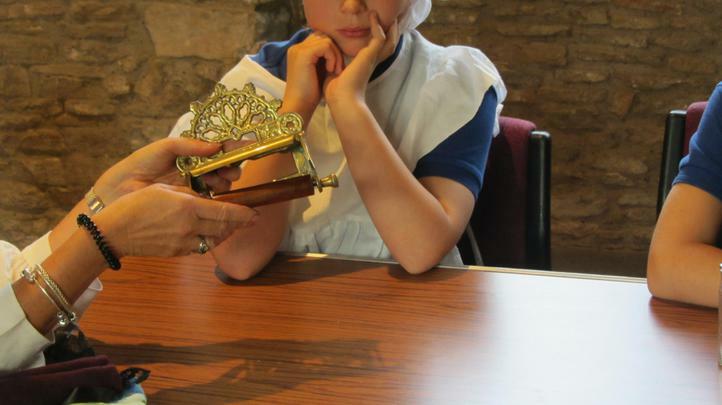 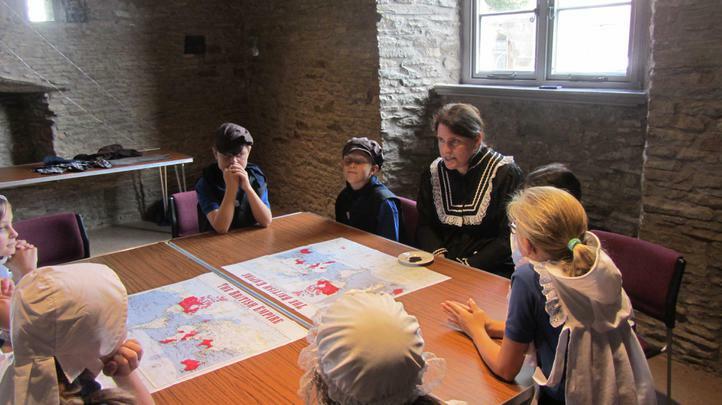 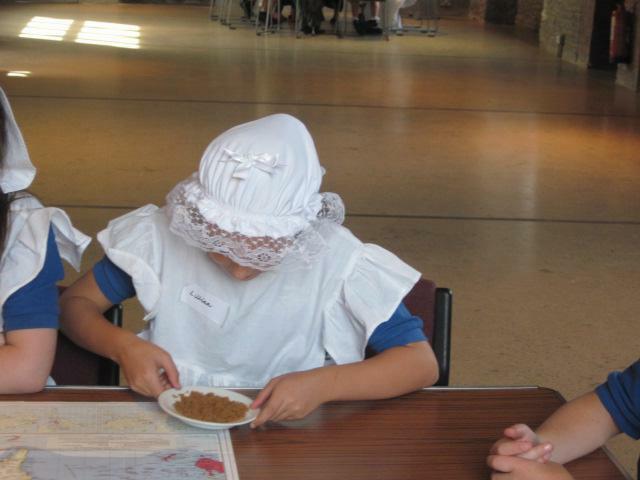 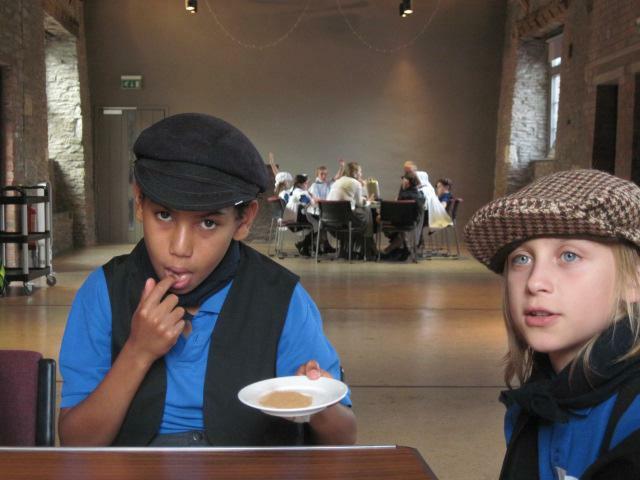 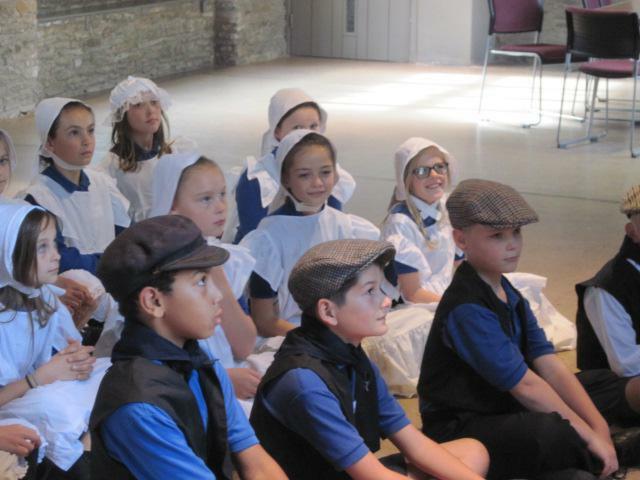 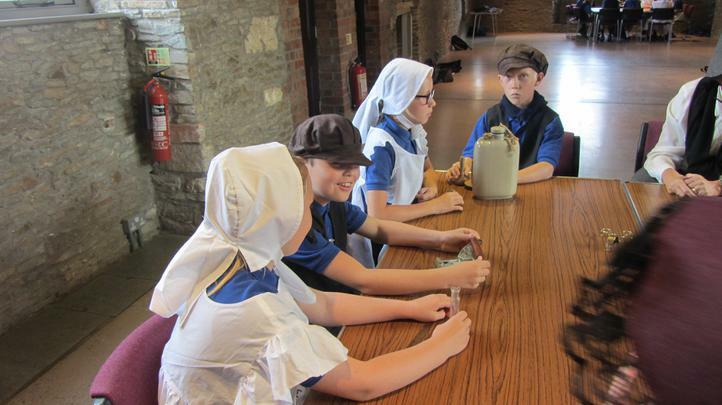 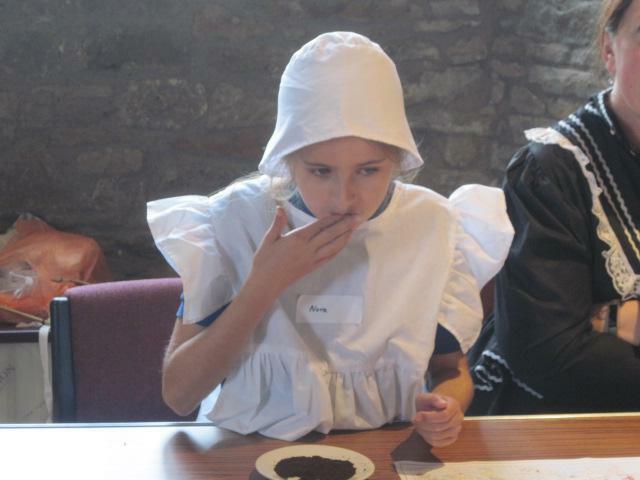 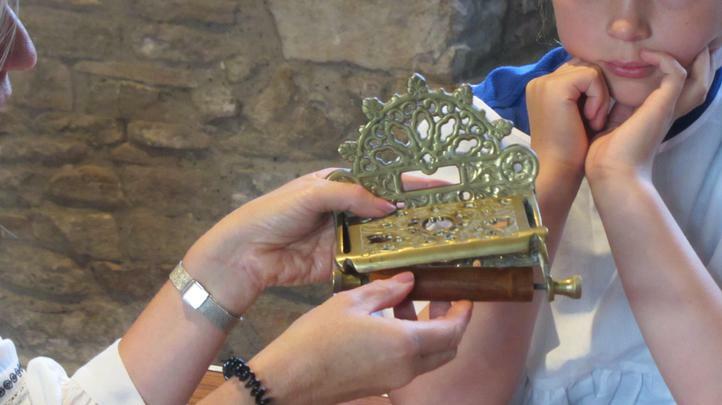 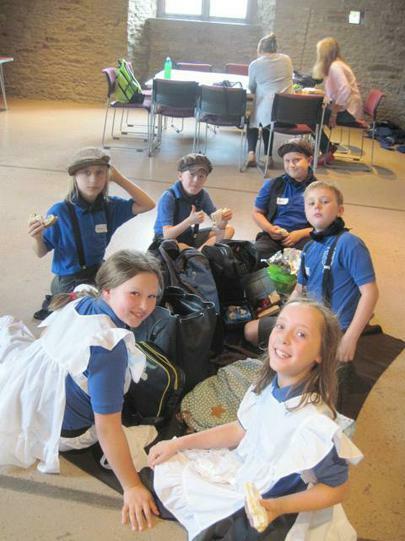 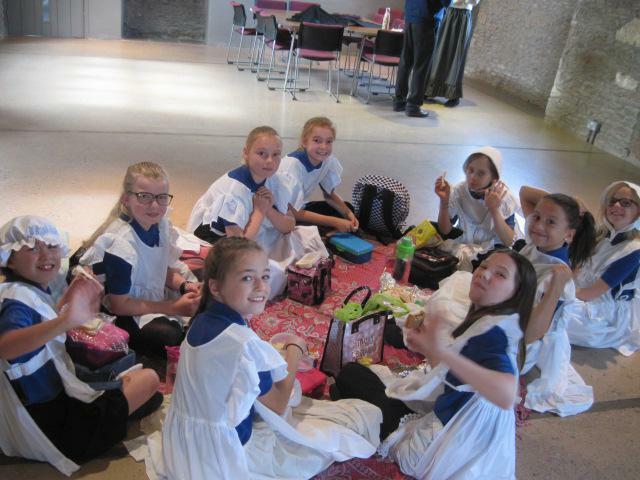 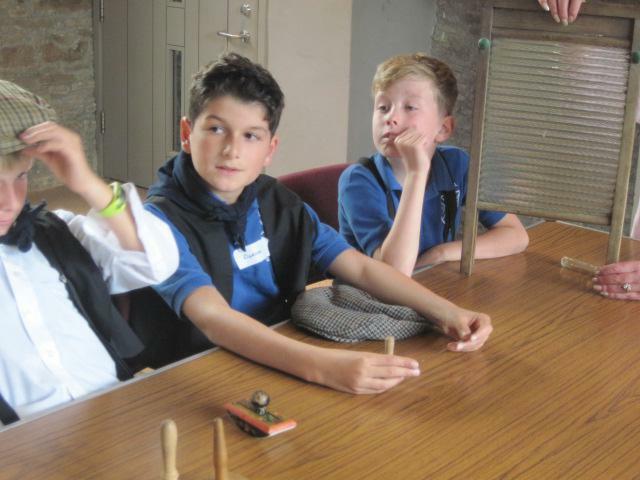 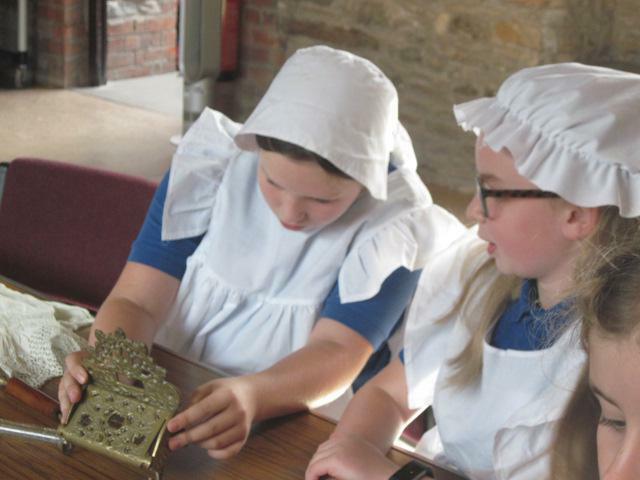 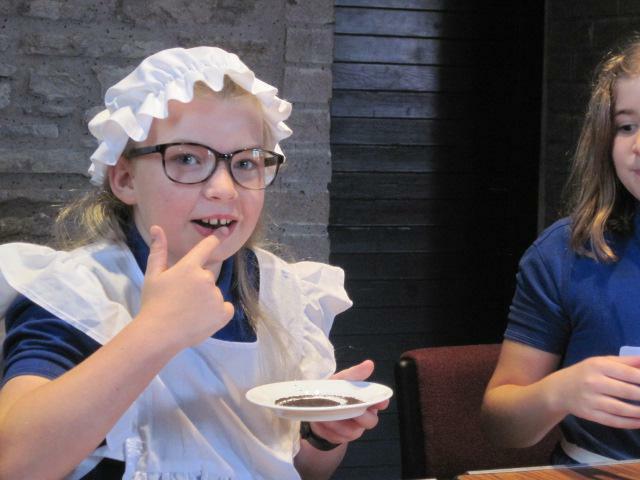 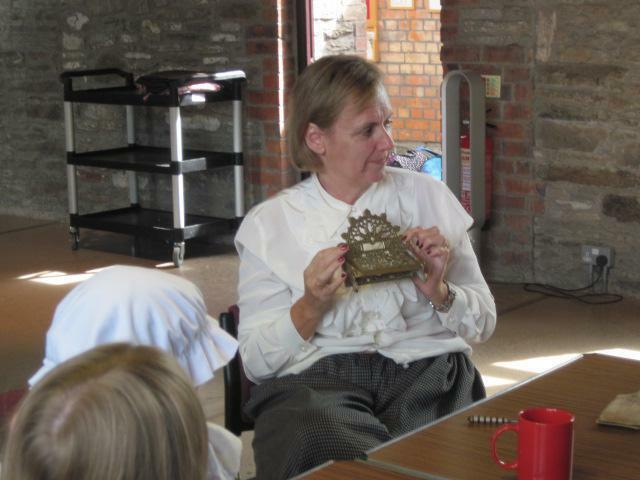 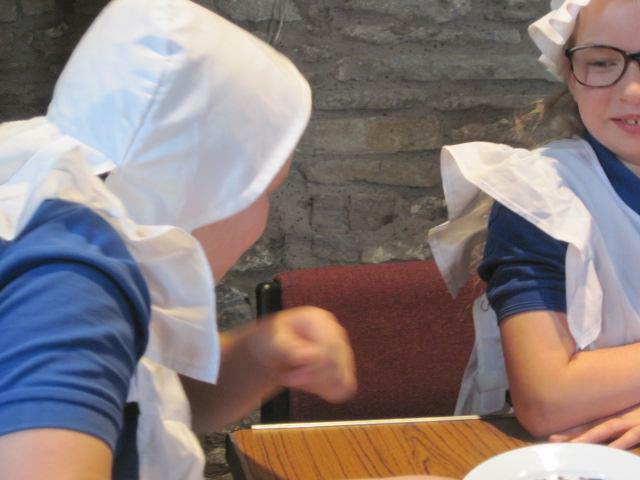 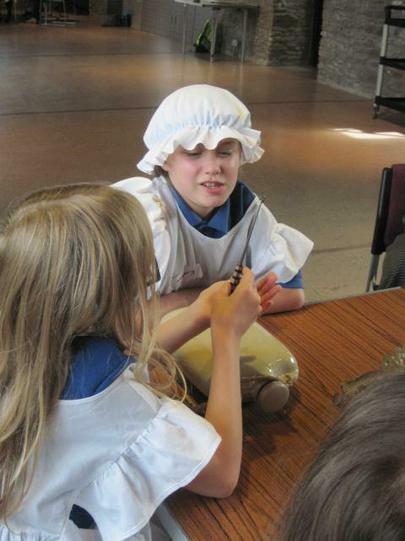 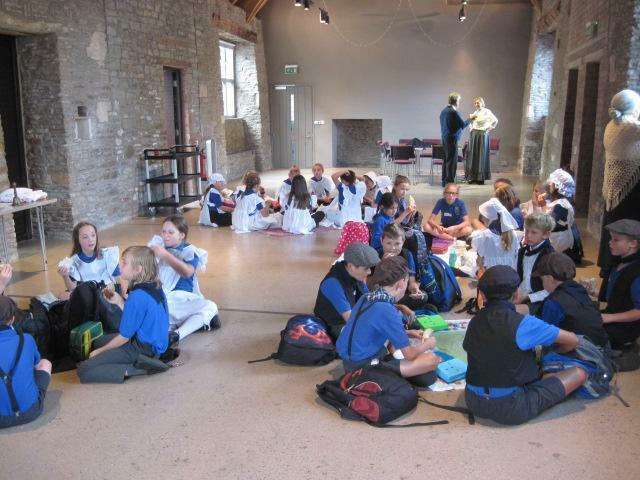 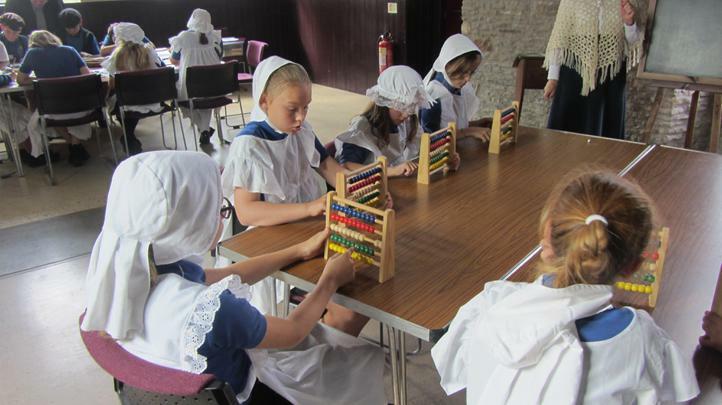 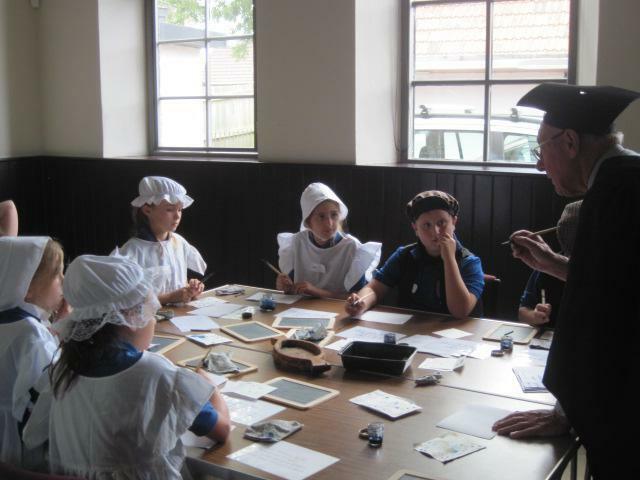 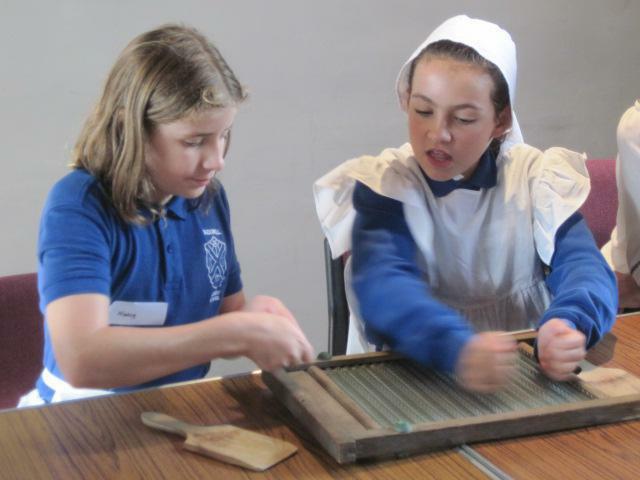 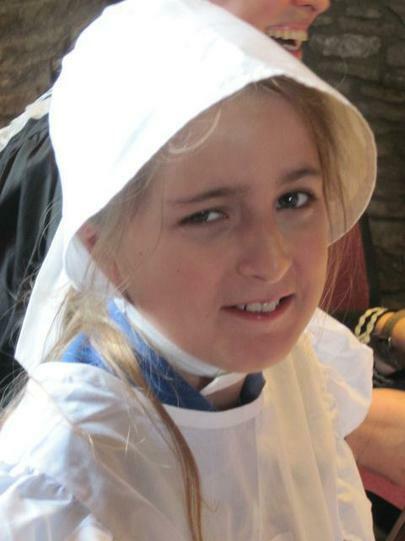 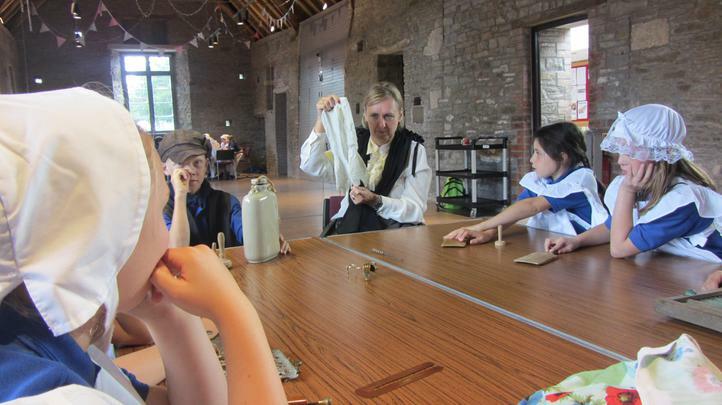 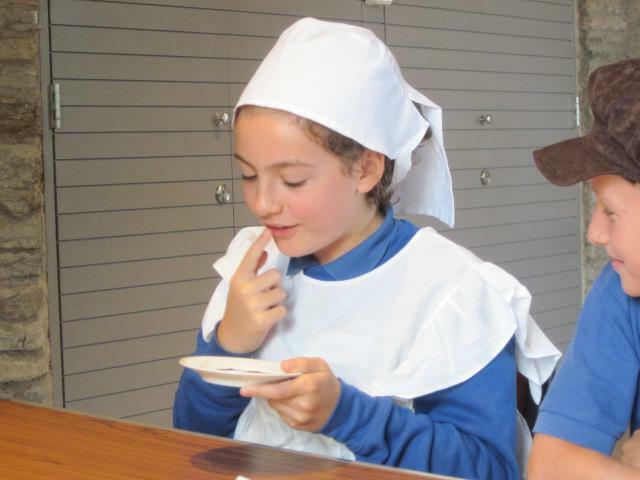 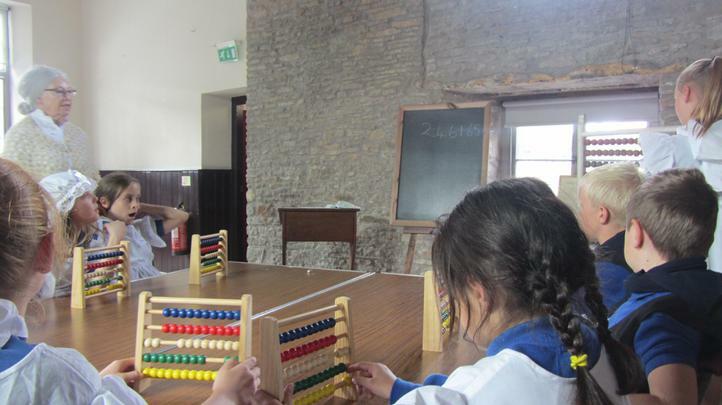 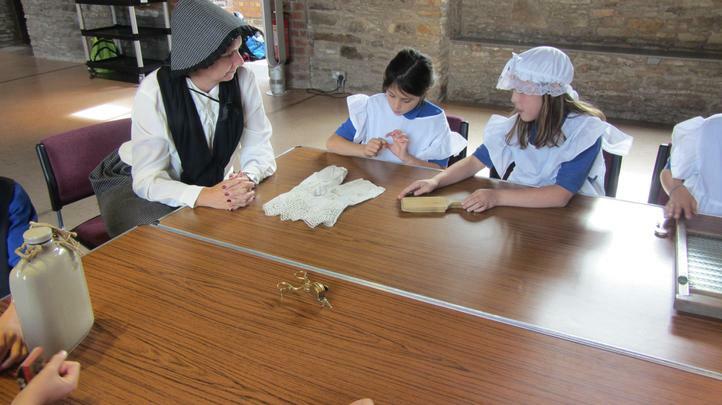 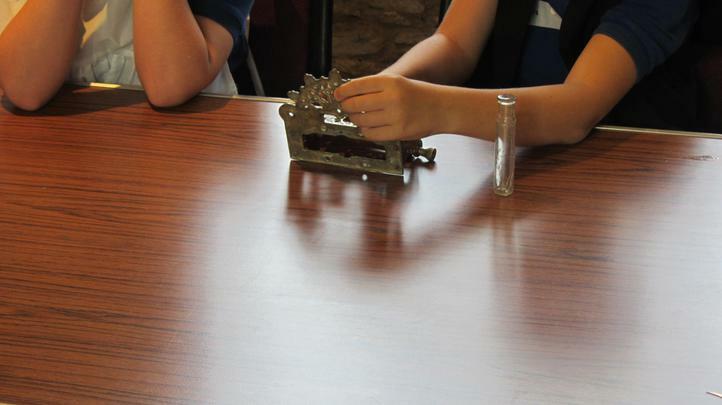 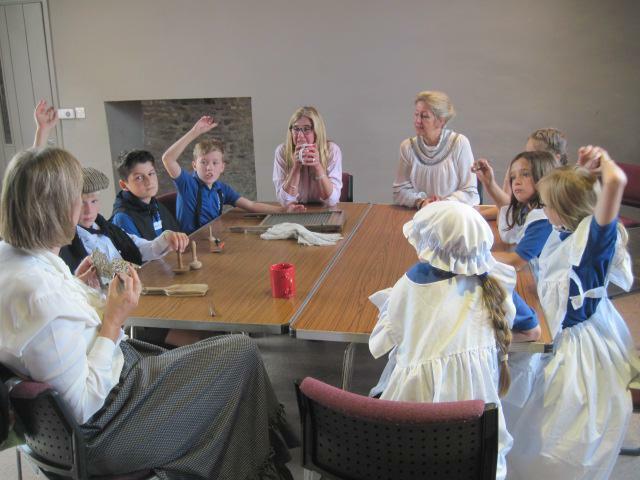 We decided to get straight into it with a visit to Nailsea Tithe Barn to experience a day in the life of a Victorian School Child and then a Victorian crafts WOW day. 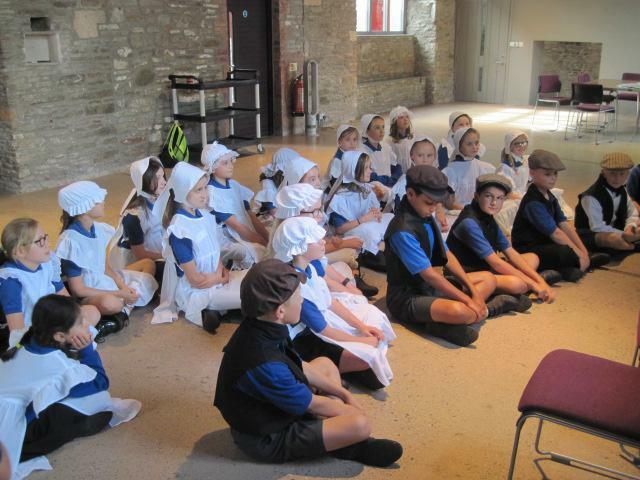 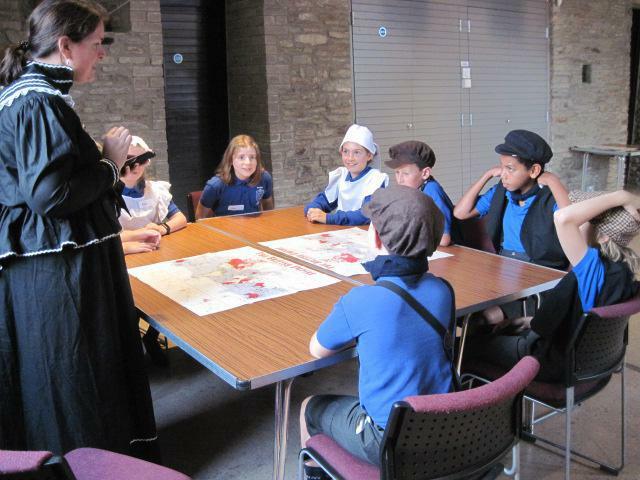 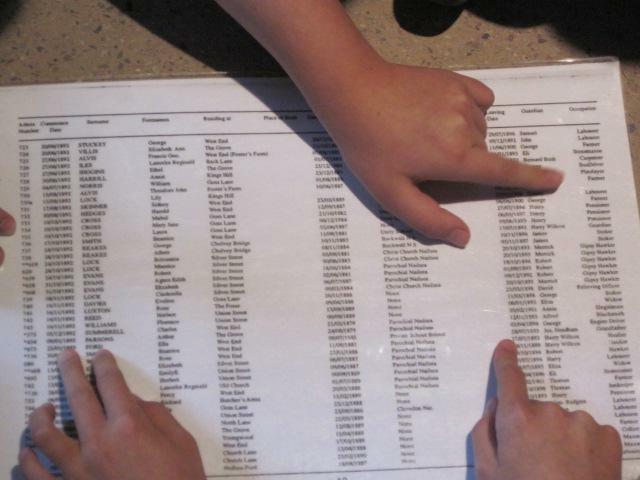 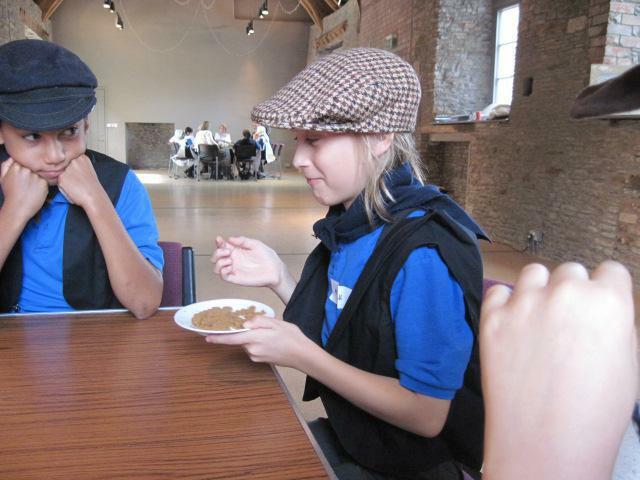 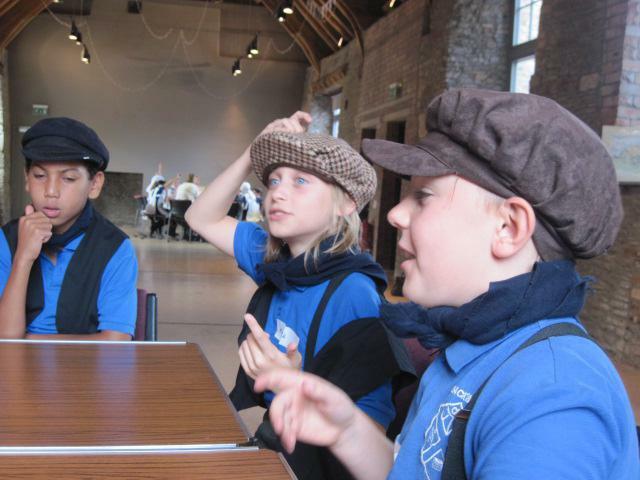 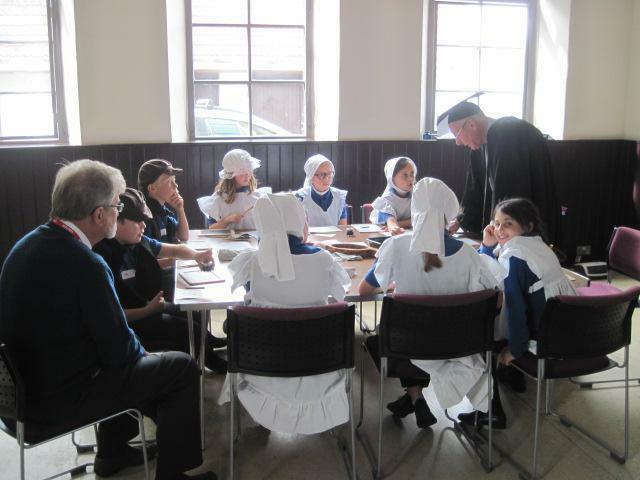 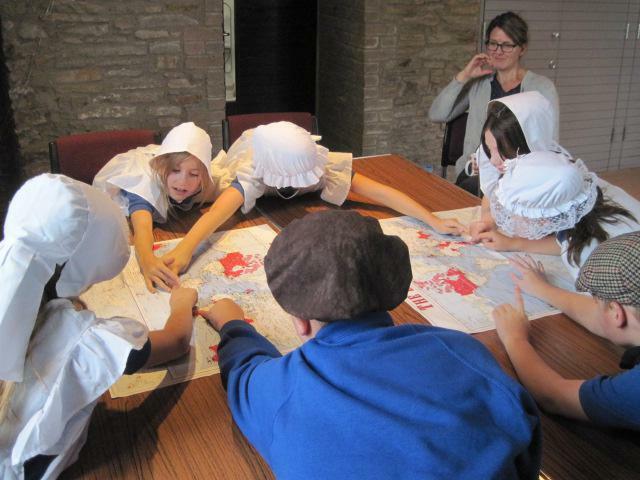 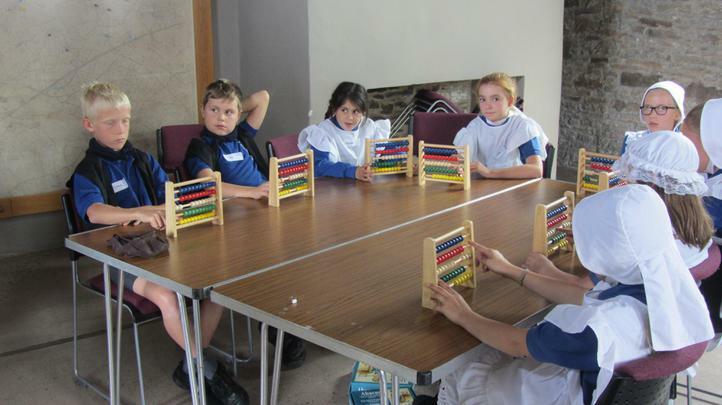 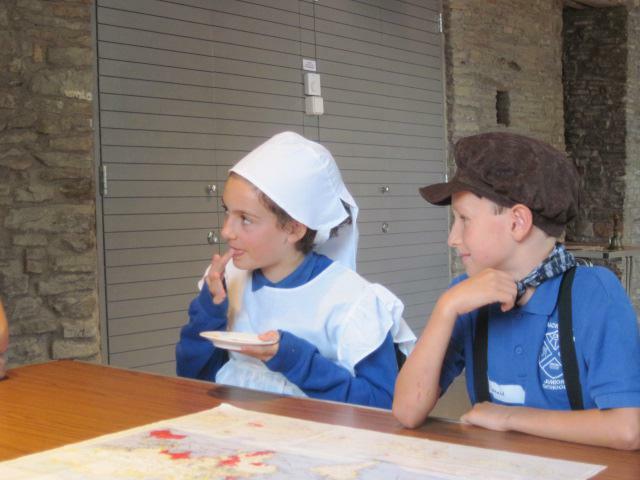 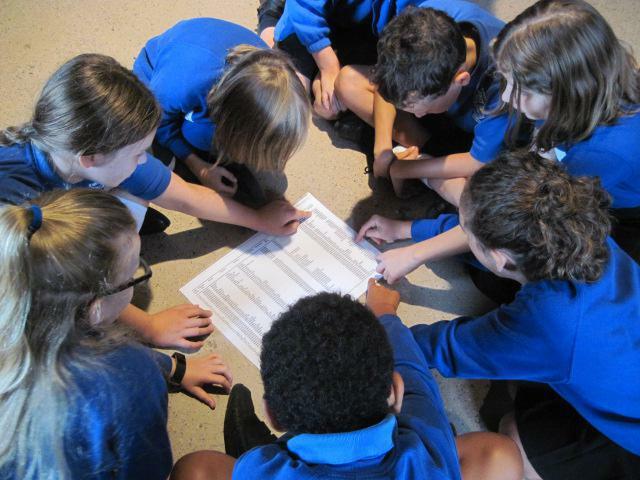 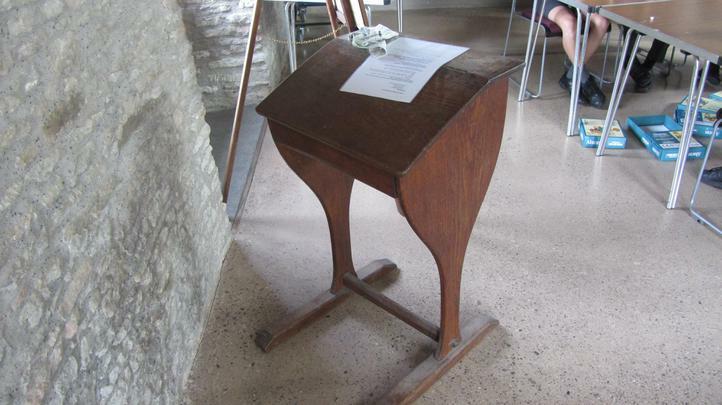 Our first task at the Tithe Barn was to research and question the historical records of the school and explore the lives, names and living arrangements of the attendees. 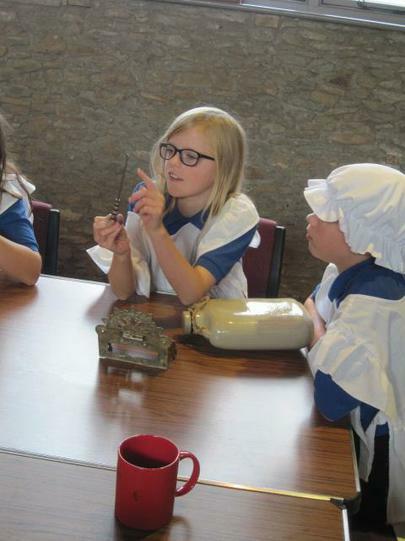 We all found it very interesting. 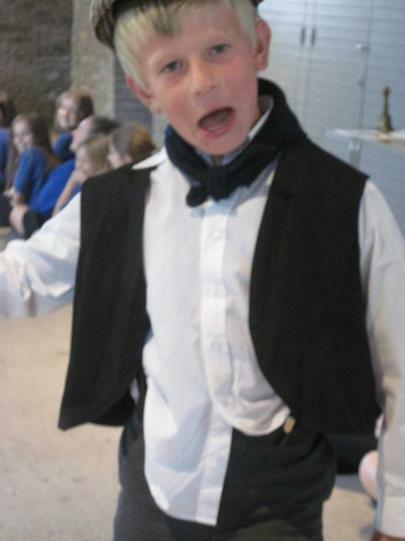 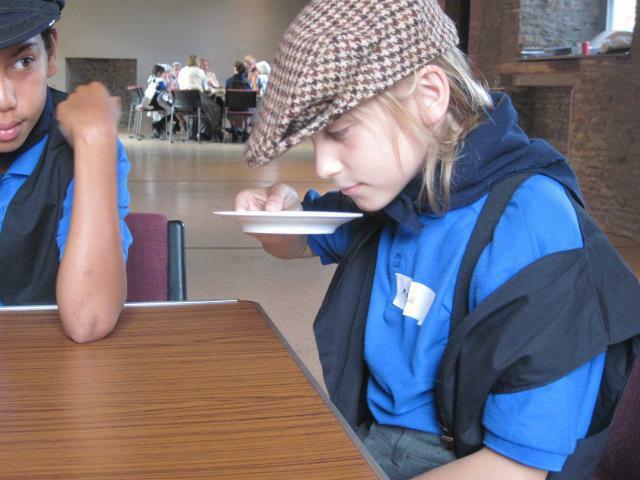 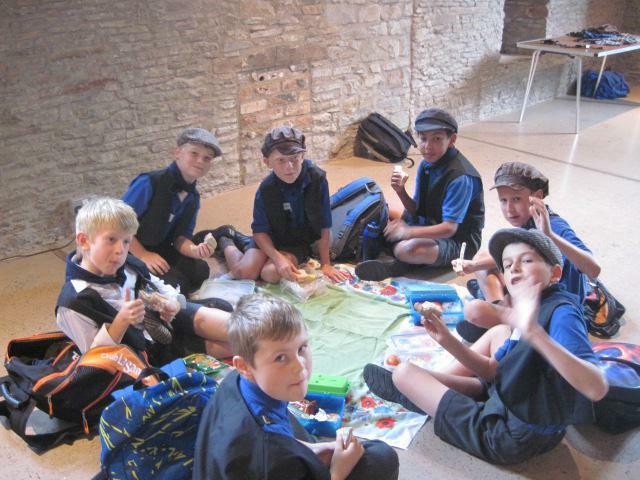 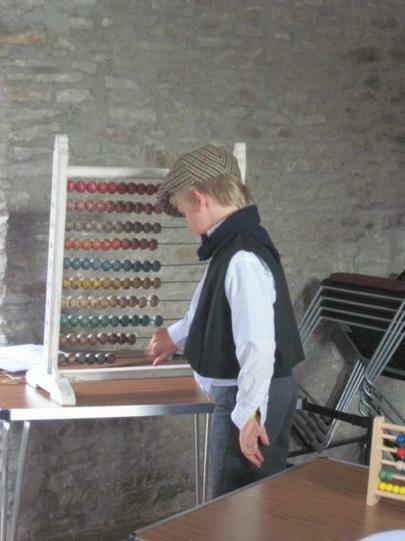 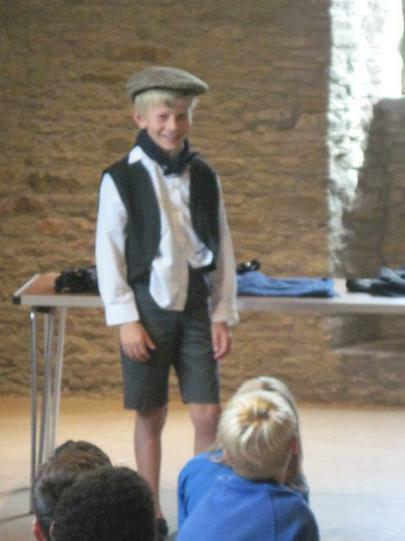 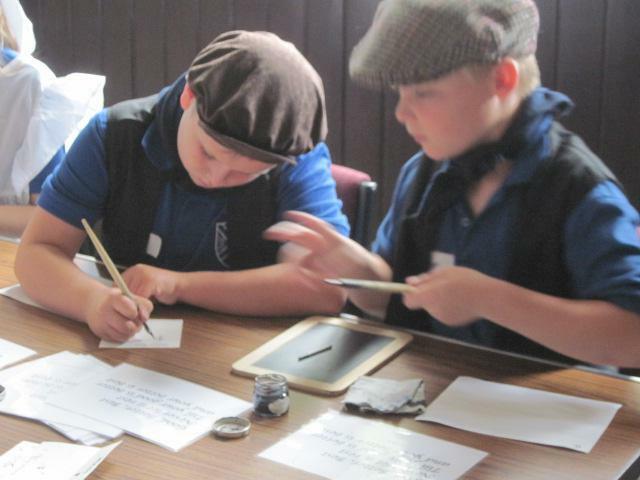 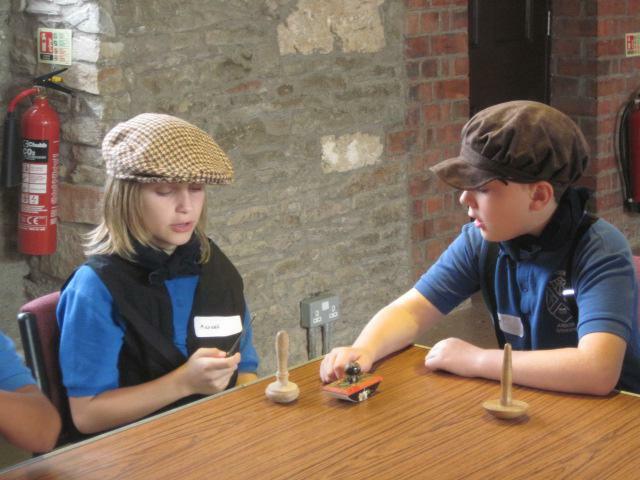 Next we needed to dress the part: boys wore caps, shorts with braces to hold them up, shirts, waistcoats and neckers. 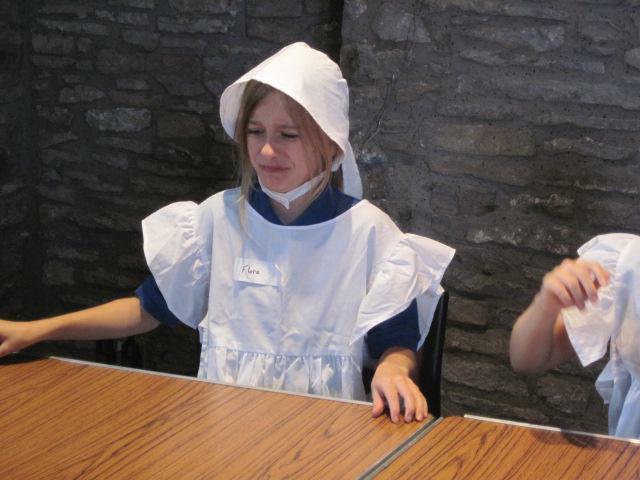 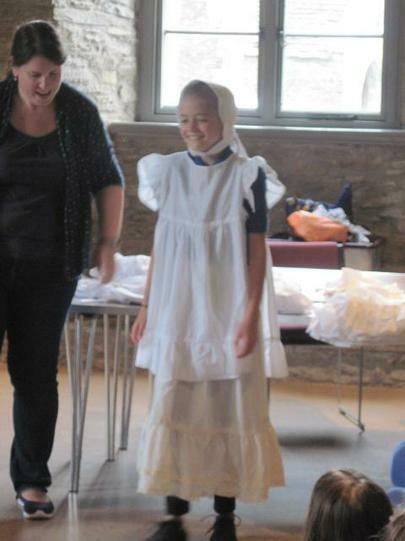 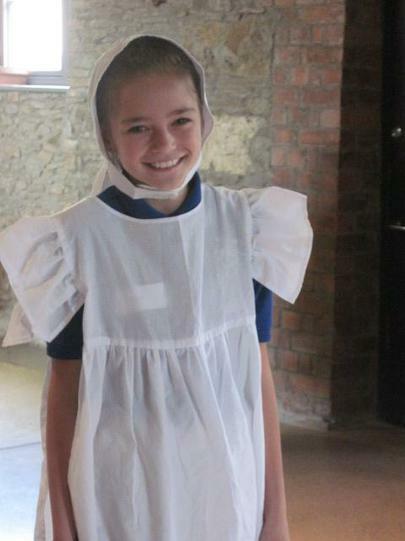 For girls it was a long sleeveless pinafore and a white cloth cap to completely cover their hair. 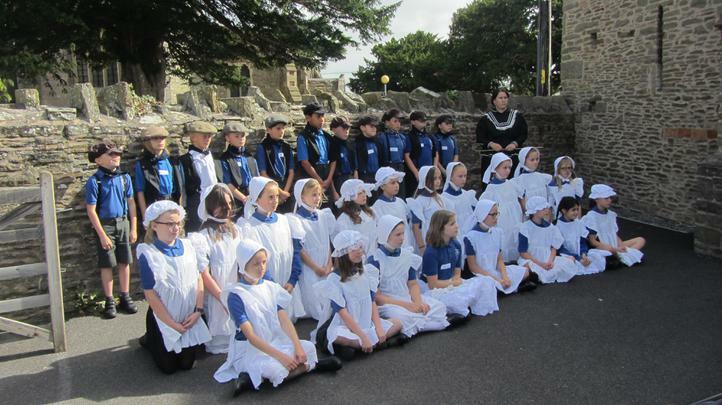 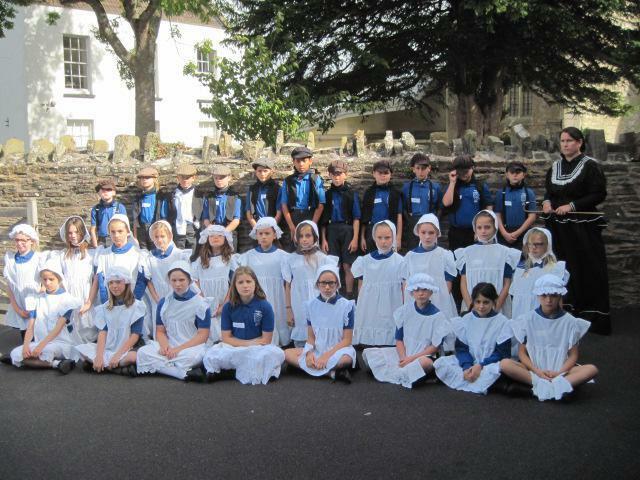 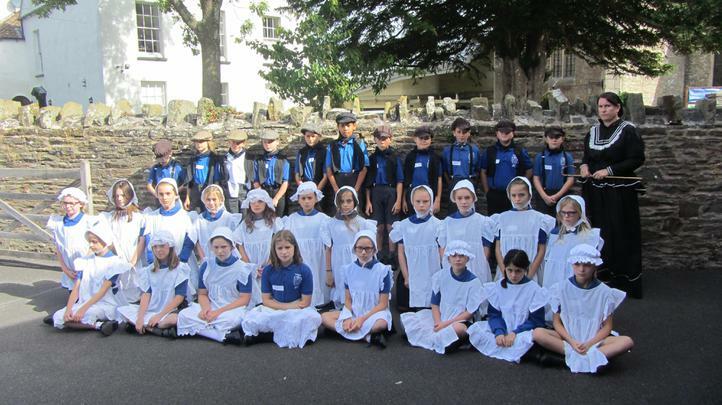 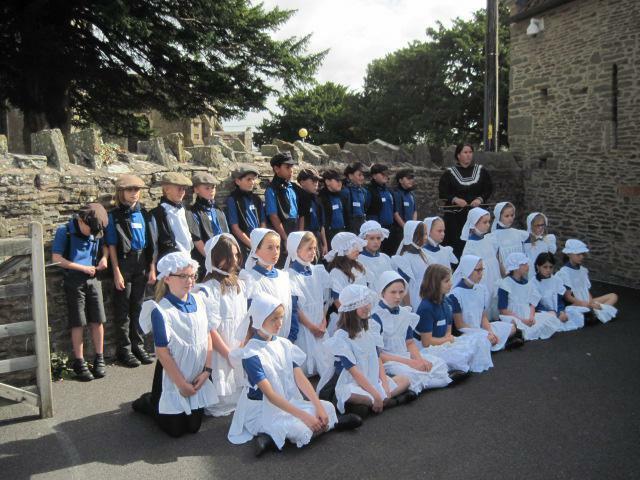 Once we were all dressed, the girls had a terrible shock when they learned that they had to spend the rest of the day lining up behind the boys as Victorians didn’t consider girls to be as important as boys!! 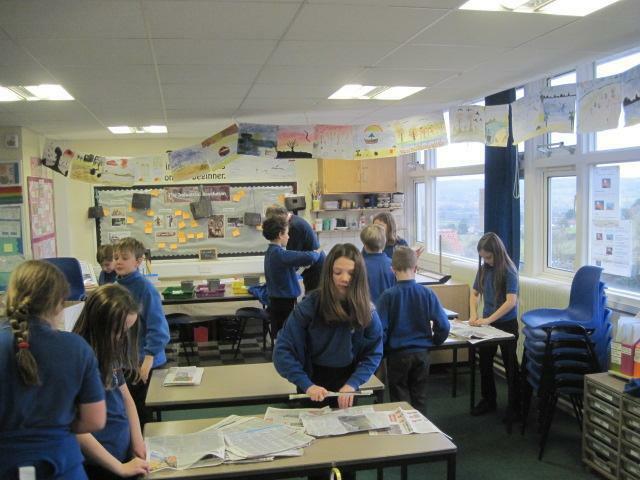 The class then split into small groups to do 4 lessons one at a time. 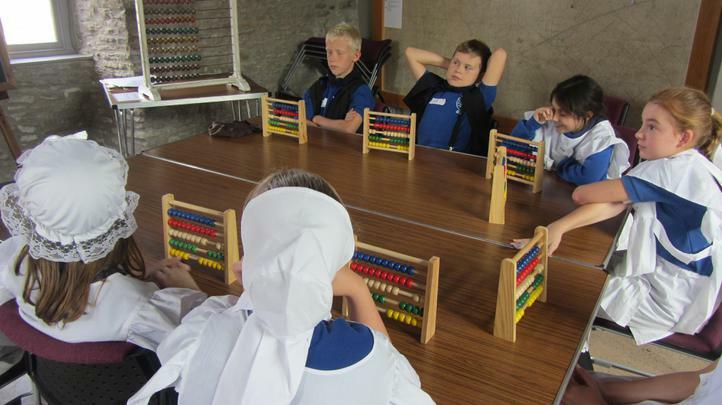 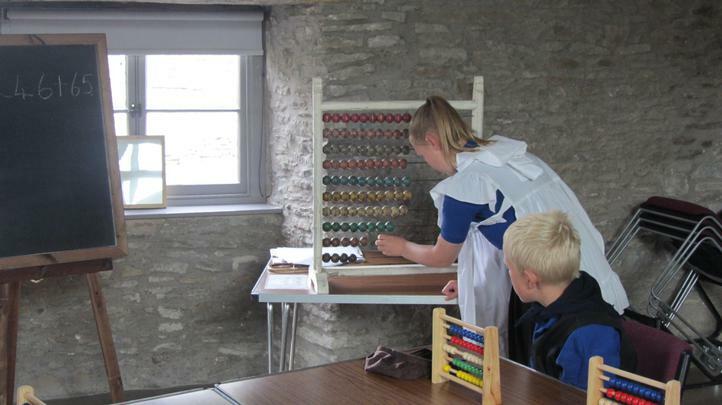 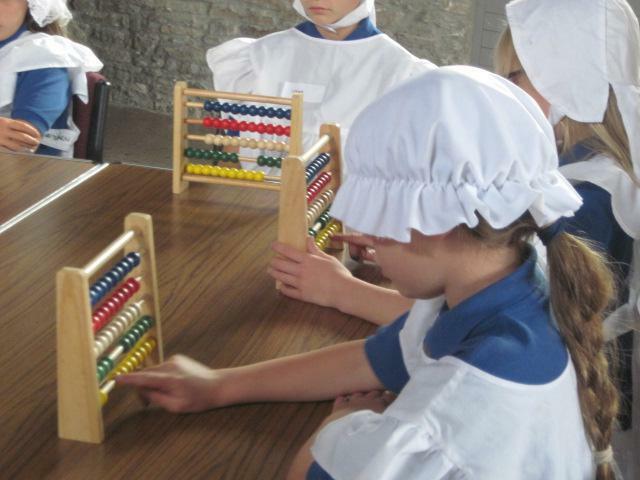 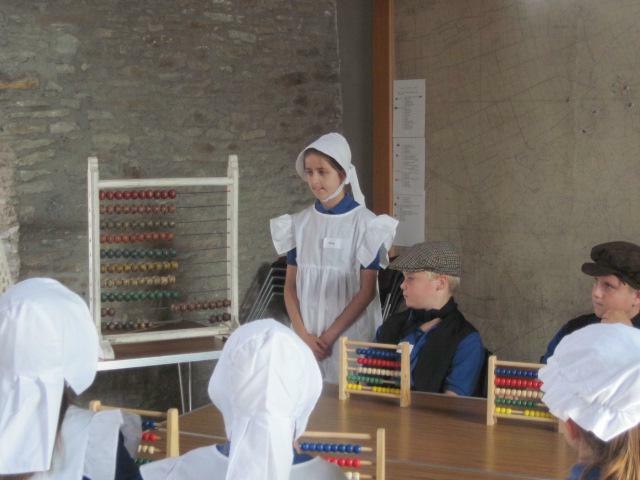 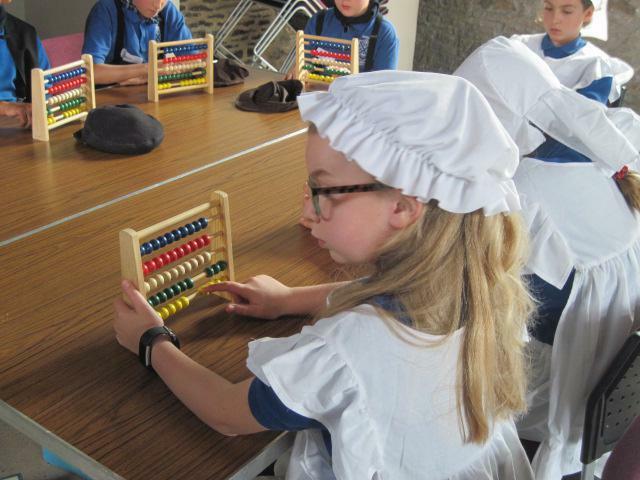 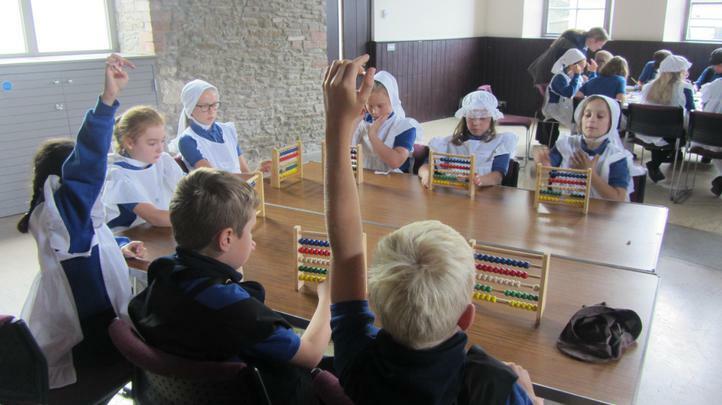 Arithmetic meant adding and subtracting but no mental maths was allowed! 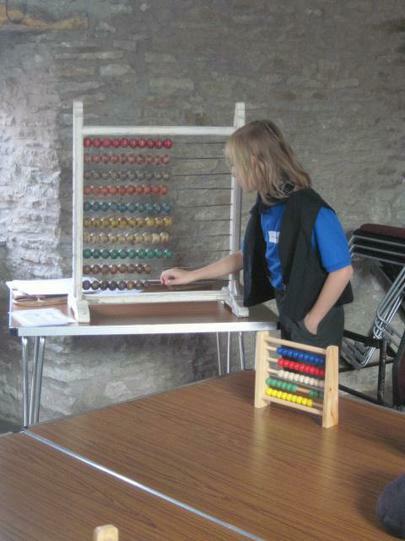 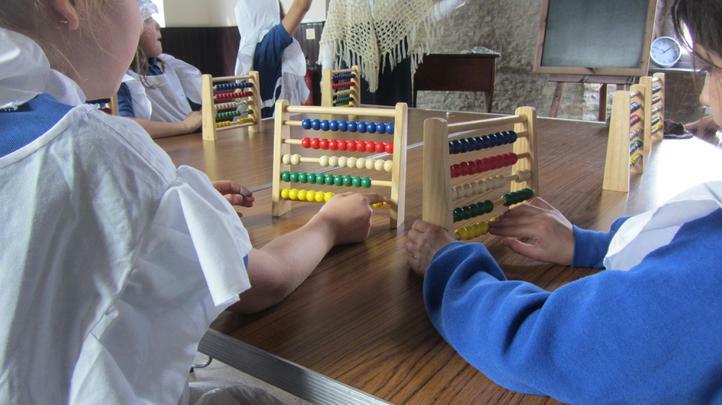 We could only use the abacus which can take a while to organise in your head. 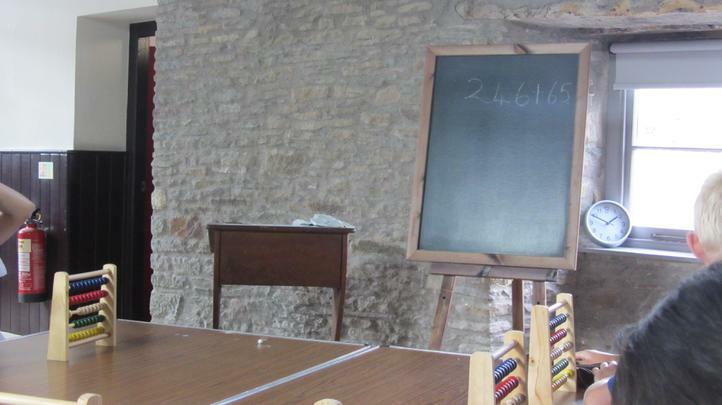 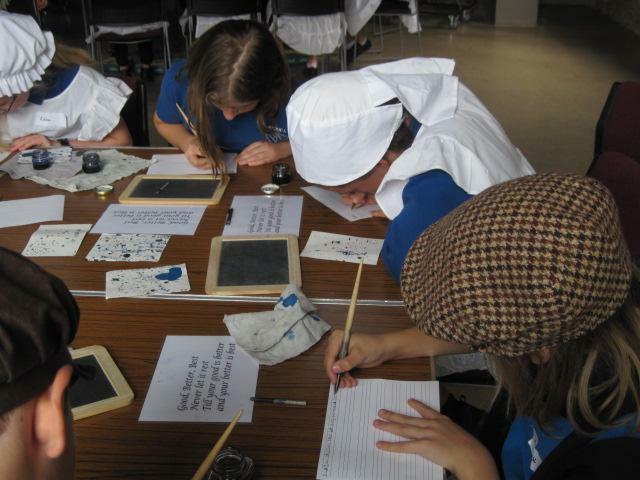 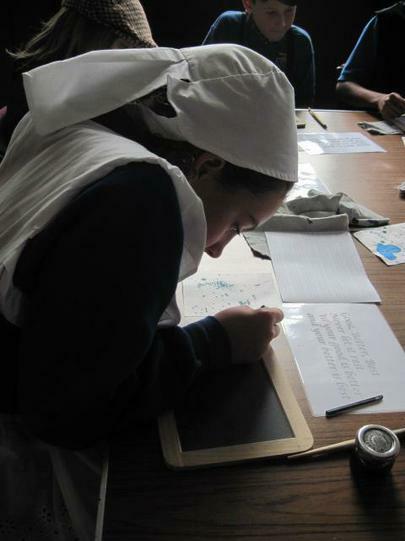 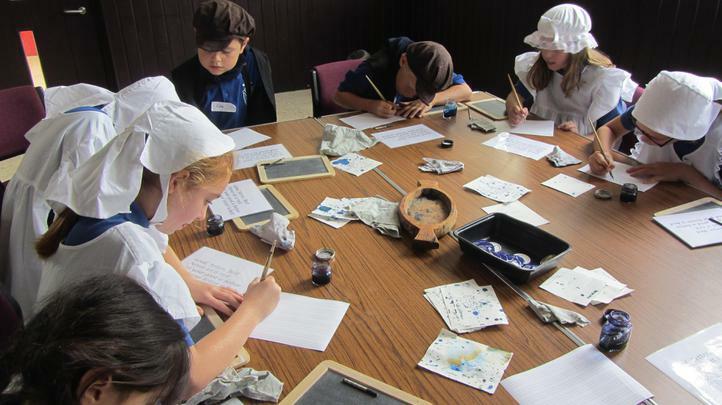 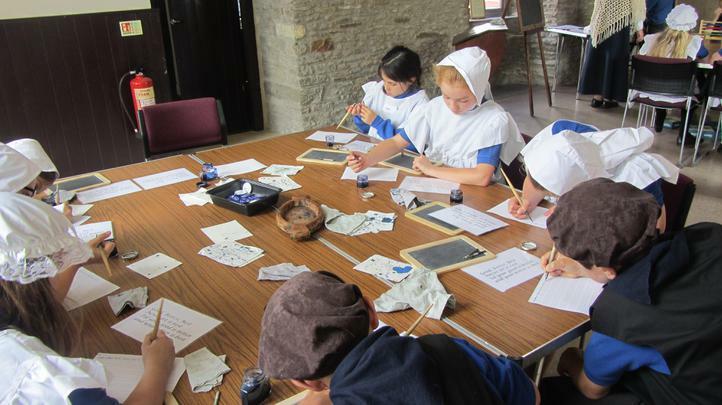 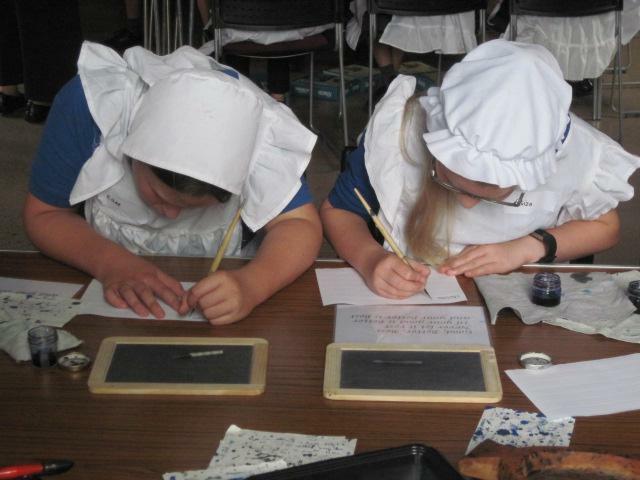 Handwriting was completed using quills and ink after practising with the old slate and chalk. 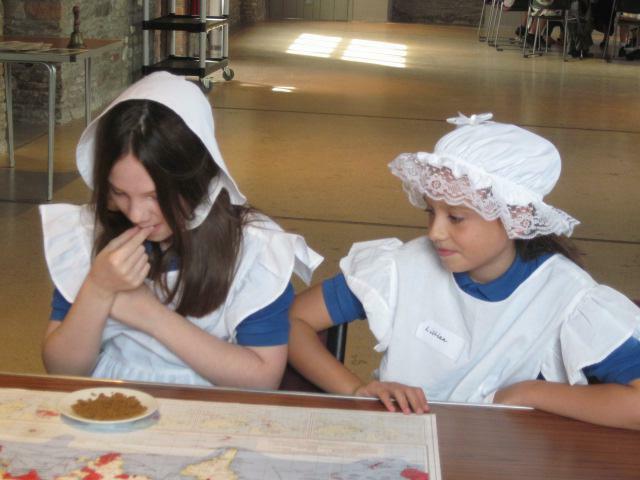 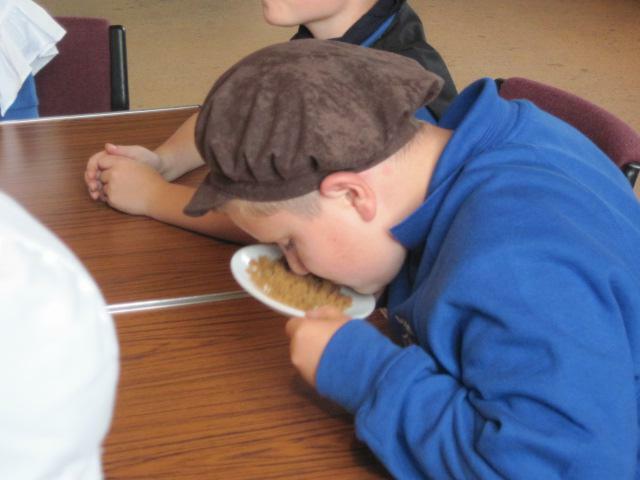 In British Empire studies we smelt and tasted the ‘exotic’ trade goods of the empire - tea, coffee, cinnamon and brown sugar – and learnt about the abolition of the slavery. 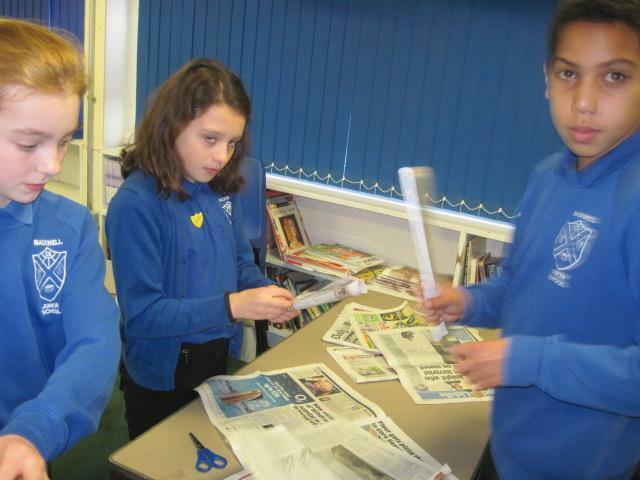 Finally, we had some mysterious objects to investigate and decide what they were used for. 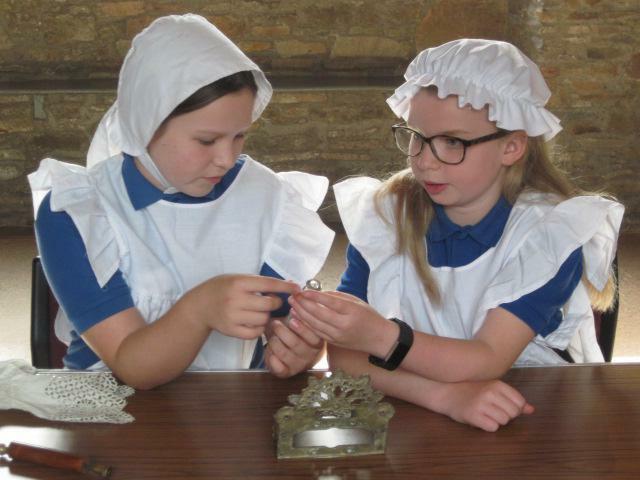 These included a pottery hot water bottle, a button hook, a washboard, darning mushrooms, butter paddles and a brass toilet-roll-holder! 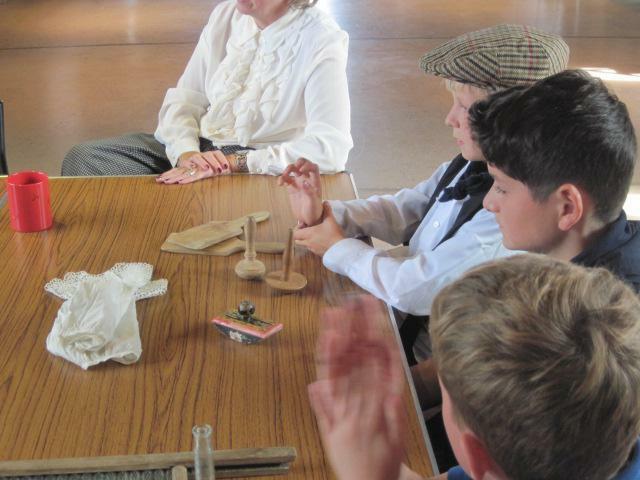 Interestingly, Victorians used a hand bell to tell them when to move class just like our bell for lining up after break! 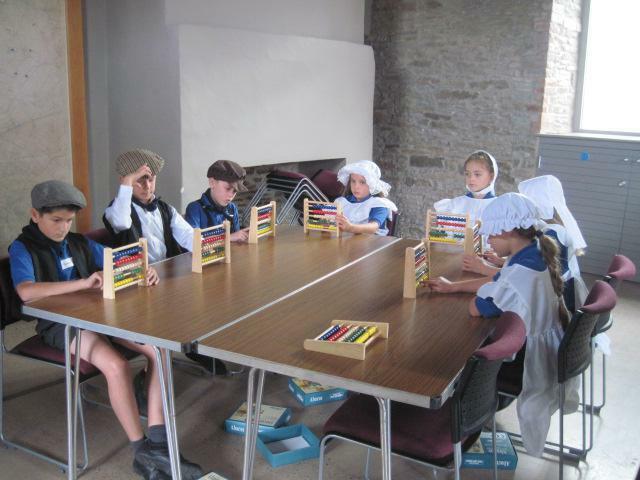 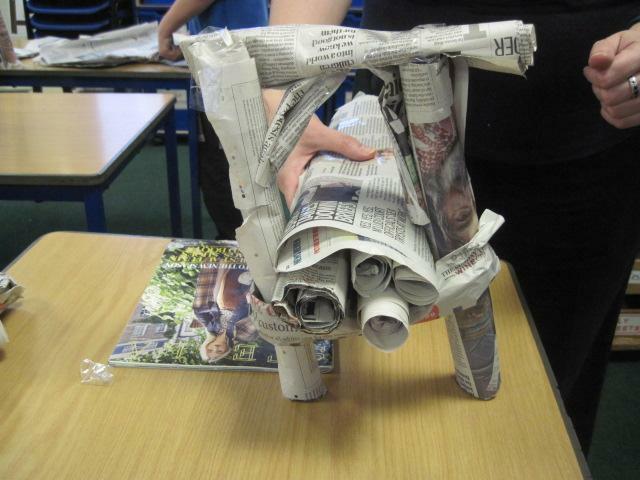 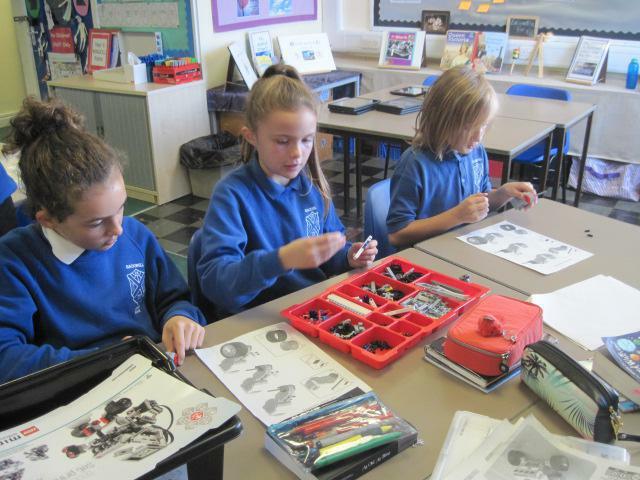 Back in the classroom we had a go at some of the craft activities richer children would have done for fun. 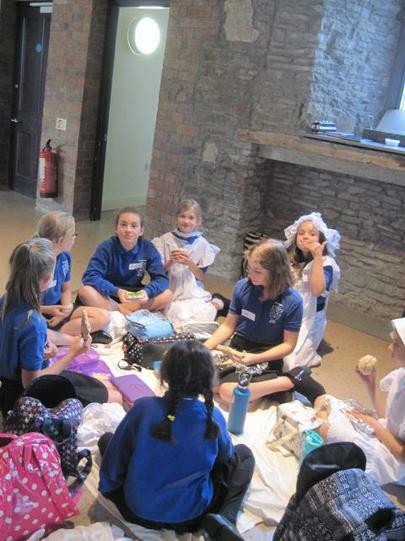 We made paper dolls using split pins and additional handmade paper clothing; created shadow portraits; made zoeotropes (which were first ever animations and produced by a Bristolian! 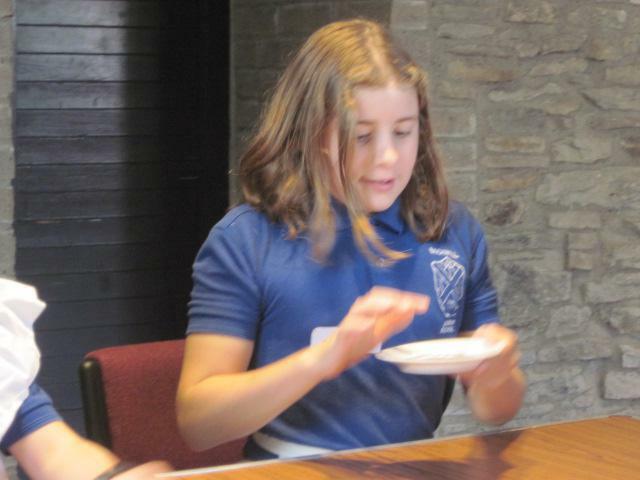 ); and baked mini Victoria sponge cakes – they were yummy!! 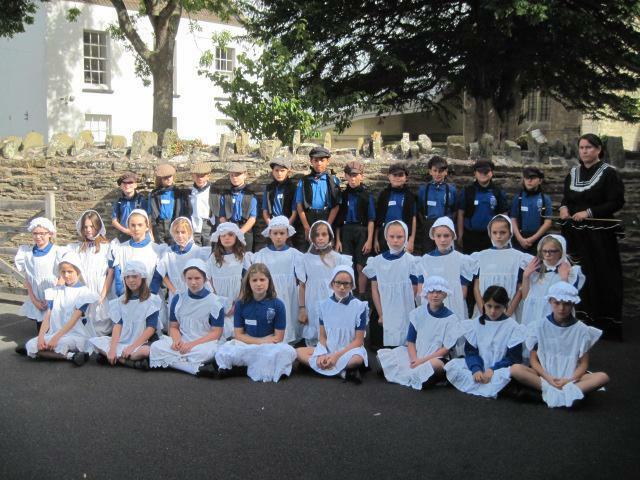 These were both great days and we learnt a lot about the lucky children who were able to go to school. 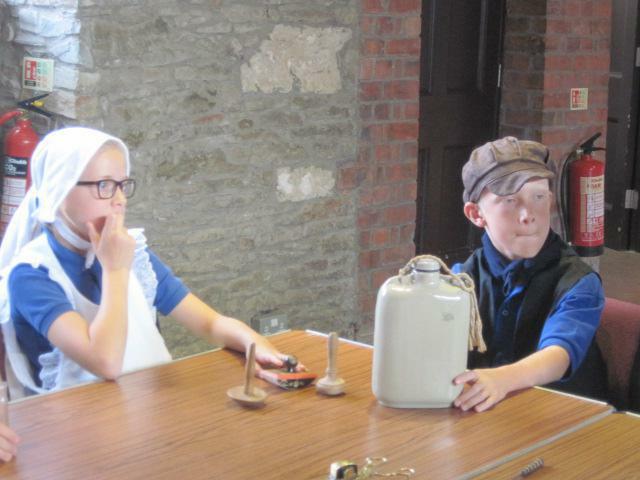 Now we are looking into the lives of the less fortunate children who had to work in factories or as pure collectors or chimney sweeps. 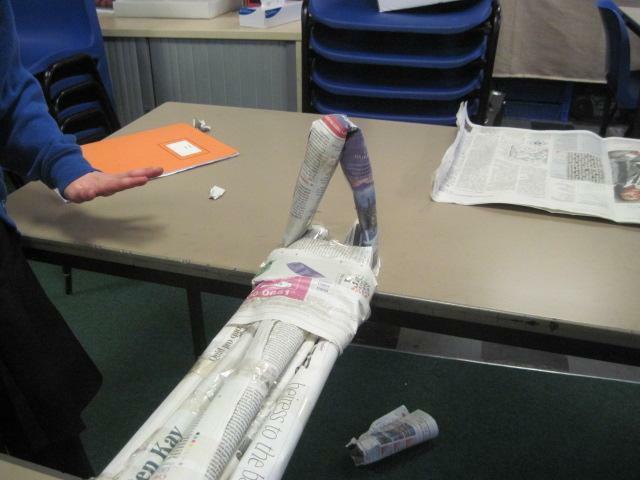 But before we go into too much detail on that, here are some photos of our studies so far.